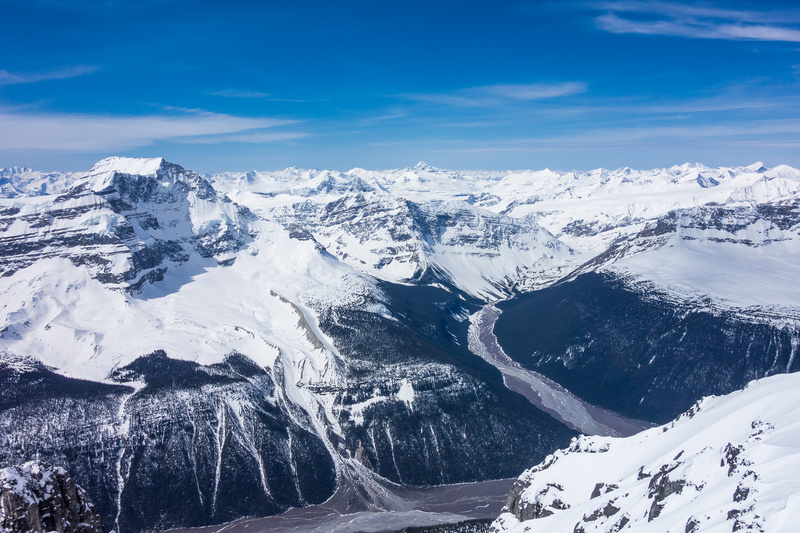 Difficulty Notes: Columbia ice fields route includes severe crevasse issues and extremely steep snow slopes. 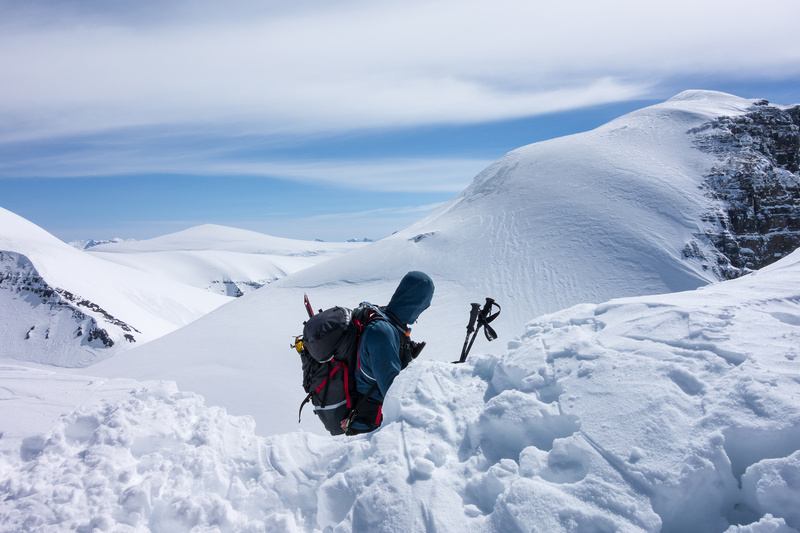 Don’t minimize these risks and learn how to manage them before attempting this trip. My second trip in 2012 was more productive. 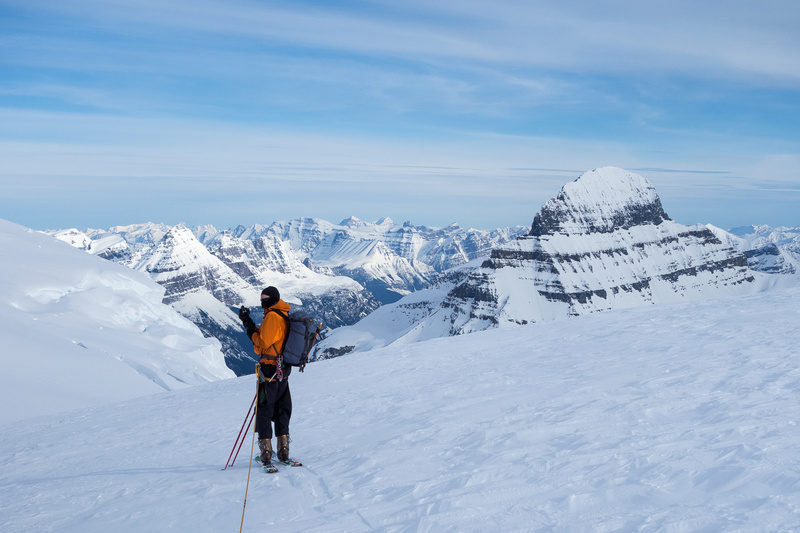 Ferenc and I made it to the summit of Castleguard Peak via the Saskatchewan Glacier from the Big Bend parking lot and back in one day on skis. 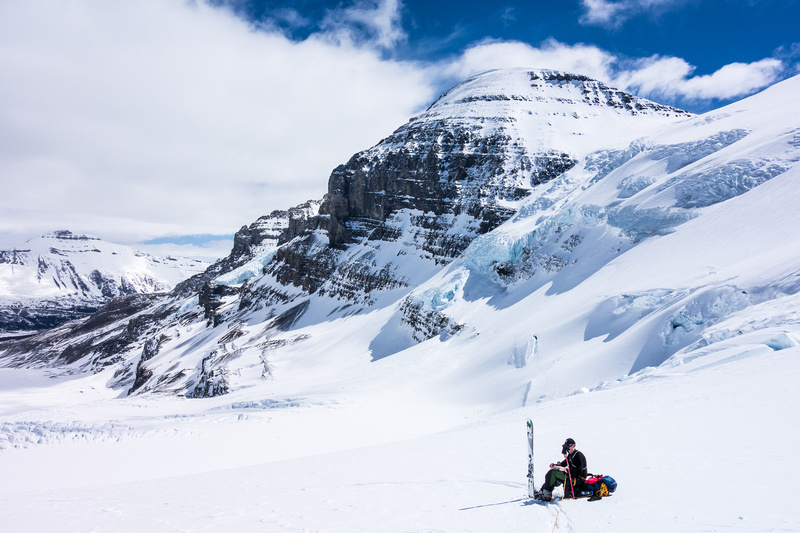 The Saskatchewan Glacier is much safer and tamer than the Athabasca approach, but also much, much longer when you’re interested in any other peak besides Castleguard. 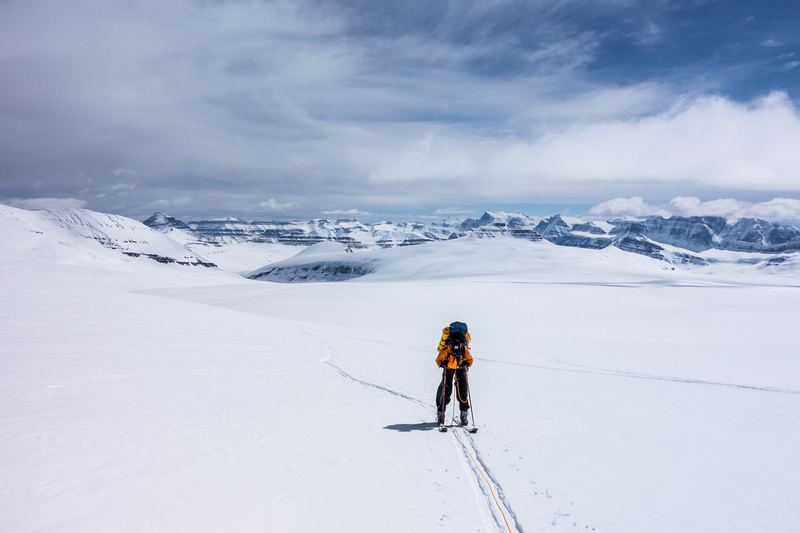 My third and final trip onto the icefield for 2012 was the most successful and my first approach via the Athabasca Glacier. It had some interesting moments when a party member was heli-evaced to Jasper due to respiratory issues but we did manage to attain Stutfield, Stutfield NE, North Twin and Twin’s Tower. On this trip we probably could have added West Twin and South Twin Peak to the list except for the incident – but no matter, we vowed we’d be back sooner than later! Sure enough. 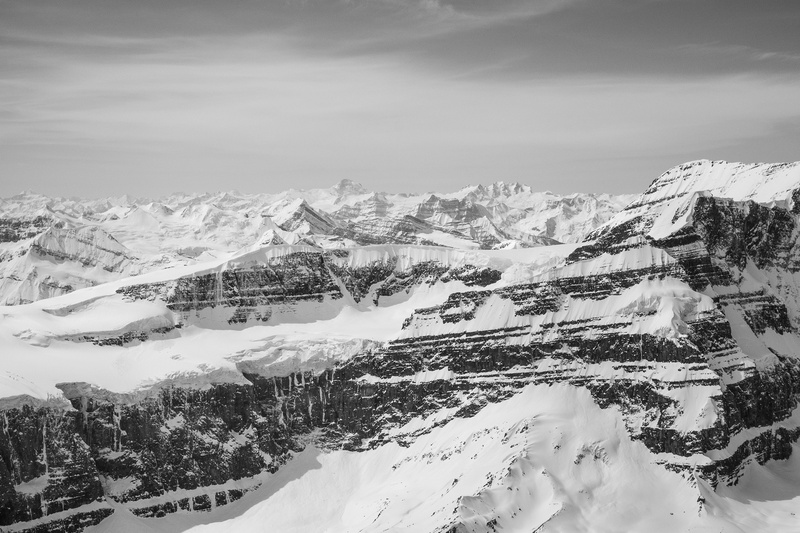 In early 2013 the emails started flying back and forth between a group of us regarding a trip back into the Twins area of the icefield to finish off West and South twin and possibly also add Mount Kitchener and Snow Dome to our objectives. By March we had a group consisting of Jason Wilcox, TJ Nault, Anton Baser, Ian Hunt, Kevin Barton and myself. We spent the next month sitting around waiting for a nice high pressure system to give us the 3-4 days we needed. In early May we spotted the perfect one forming and planning began in earnest. We would be going in two rope teams of 3 persons each. 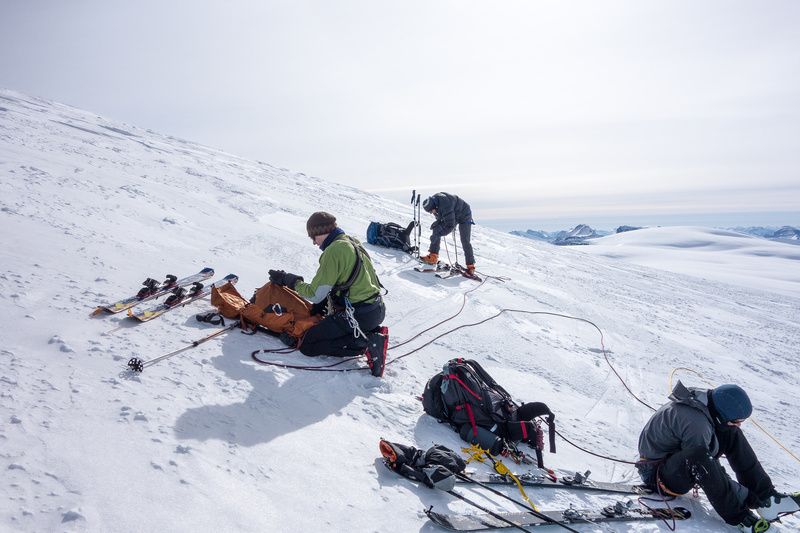 Ian, Kev and Anton were going for more of the northern icefield peaks, whereas TJ, JW and I were only interested in two of them since we’d done the other four. As the weekend grew closer we realized that it was probably going to be very warm. Mountain-forecast was showing temperatures as warm as 6-10 degrees at 3000 meters and over night temps of barely freezing over the weekend. 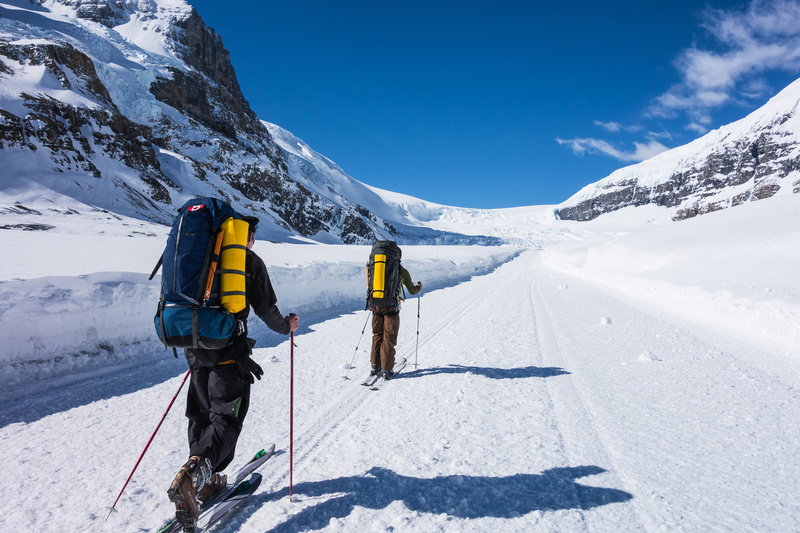 Skinning up the snow coach road on the Athabasca Glacier. After reorganizing some of the group gear we were ready to rock ‘n roll. The steep hill near the terminal promised to be fun on the way out but soon we were off the gravel road and skinning up the ice road to the snow coach terminus. 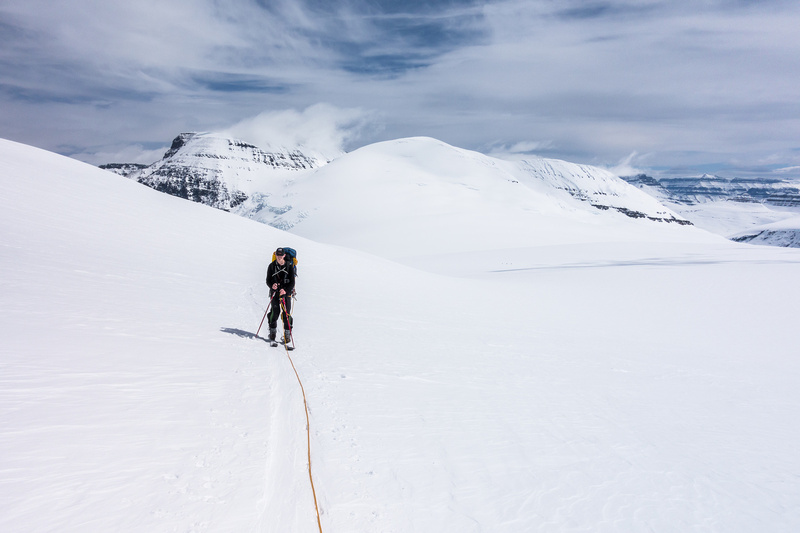 At the end of the snocoach road we roped up and proceeded across the Athabasca Glacier towards the climber’s right side, following other’s tracks to the safest route up. 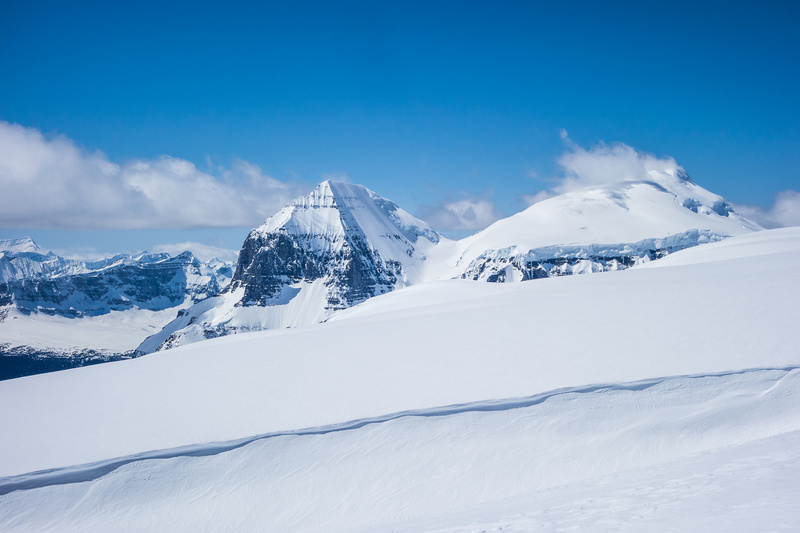 We witnessed another group of 3 going up just ahead of us and yet another group was already making its way up the ramp to the main icefield. 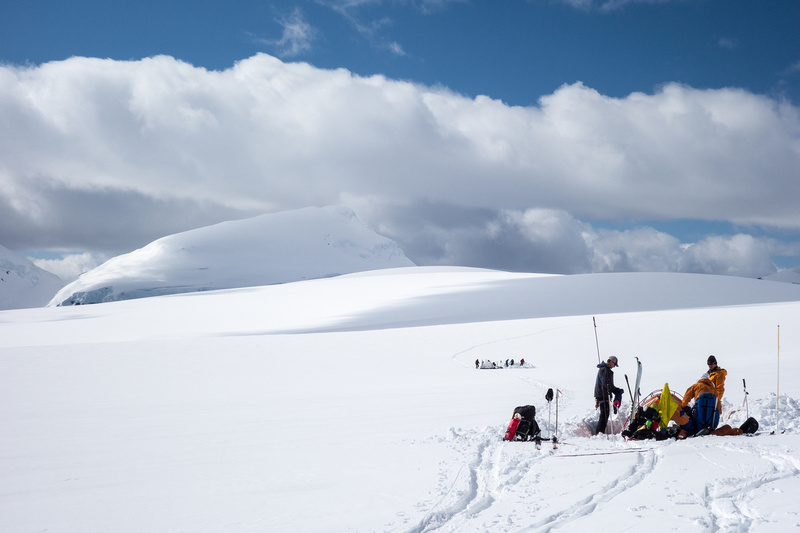 It was going to be busy on the glacier – no surprise given the great forecast. 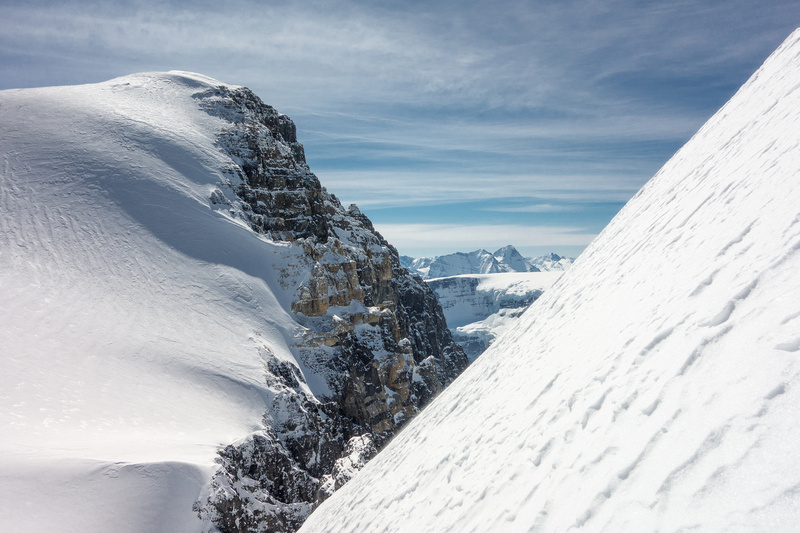 Approaching the headwall. Last year the ascent track went more left here but we followed the tracks up the obvious ramp just above TJ. 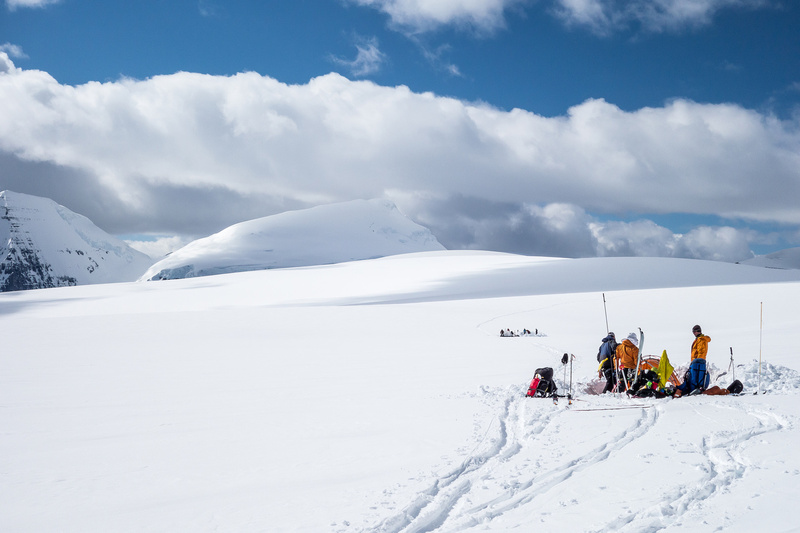 We quickly passed the group at left who turned back from the serac zone and went the other way through the crevasse fields at left. We were quite a bit ahead of the other group by this time and wouldn’t talk to them for the rest of the day until they joined us at camp. This wasn’t an issue as the approach route looked to be in great condition and each group was carrying radios thanks to TJ, just in case something did happen. 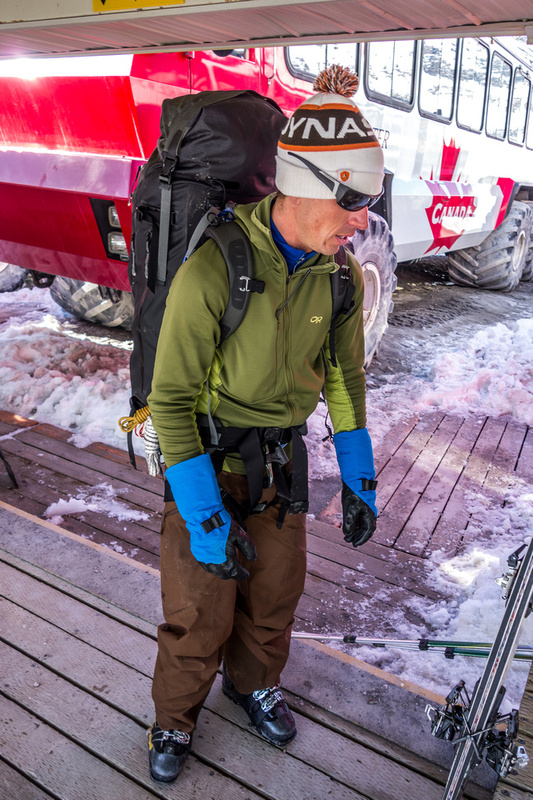 After dashing through the serac runoff zone beneath Snow Dome (very inactive on this particular day) we started working our way up the ramp under a rapidly warming sun. Above the ramp the weather went positively nuclear. It was so incredibly hot that JW almost found himself with minor heatstroke! Honestly, I’ve never been so hot on skis before. The sun was beating down mercilessly and we were in a little draw, completely protected from any hint of a breeze – it was stifling to say the least! Quite the opposite of the year previous when we were all in danger of freezing in a whiteout and cold wind. 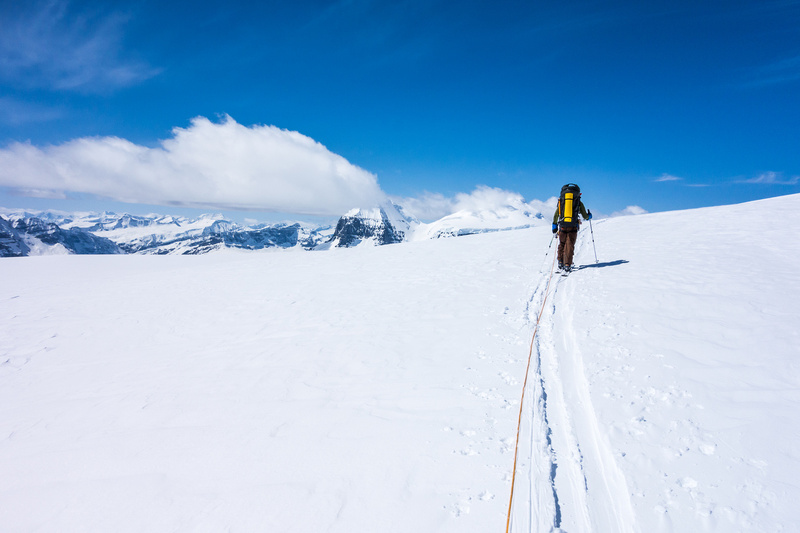 Ascending the ramp to the Columbia neve – this is the key terrain feature that makes the Athabasca Glacier approach to the main ice field feasible. Taking a break to contact the other team (via radio) and cool off! Andromeda directly above JW here. Eventually the angle started easing off a bit as we rounded the shoulder high on Snow Dome’s northwest side and a cool breeze gave us life again. We proceeded to ski towards the twins off in the distance until we were on Kitchener’s west flank. Here we stopped for a short break and decided that this would be our home for a few nights. 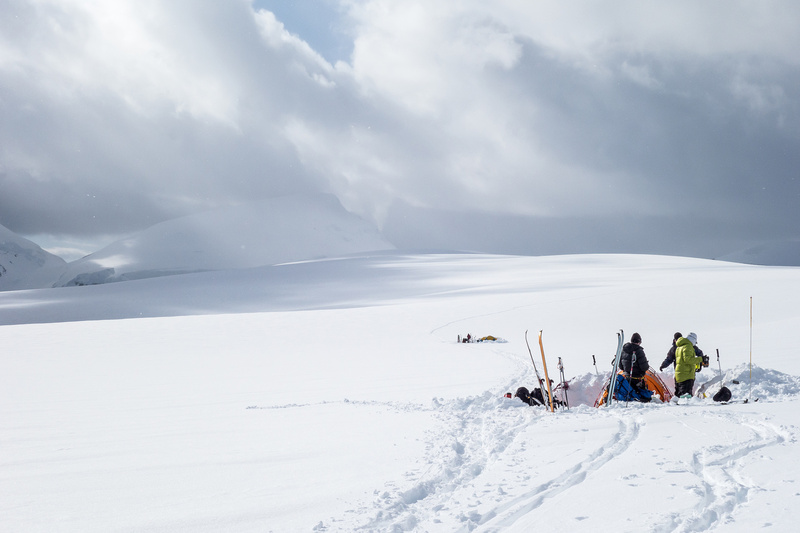 We were still around 5km from where we camped the year before and at least 1-2 hours from the ideal camping spot for anyone bagging peaks on the northern end of the icefield but we only needed to ski over there one day and didn’t mind dropping the heavy packs early. It was the perfect spot to ski up Kitchener from and the perfect spot to protect us from the elements. We had great views of Bryce, Columbia, Edward and the Twins too. Mount Columbia starts coming into view as we keep cooking on the warm Spring day. Digging out the floor in our Mega Light. 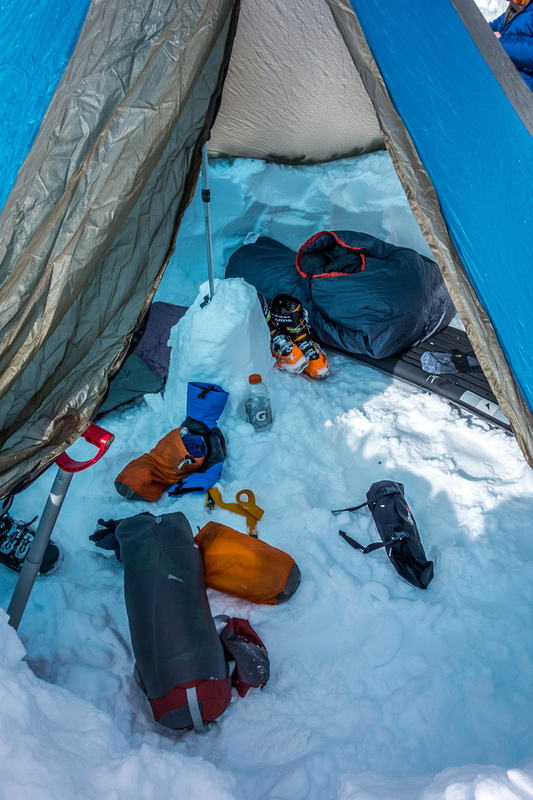 The key with this minimal shelter is to get the floor dug down at least 18 inches. By the time I was done with ours it was closer to 30! Dug out nice and deep! Other teams were waylaid by our camp and decided to set up next to us throughout the afternoon! The far team is a guided party and the closer team is the crazy Pol – Raff and his buddies, who were going to see if Cromwell is an 11,000er or not. 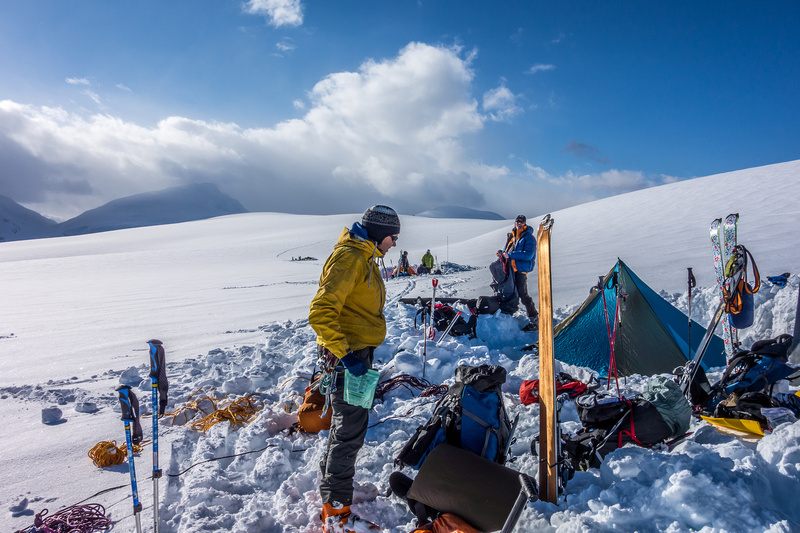 Camping on a snow field is always interesting. It’s much easier in nice weather. An impressive sunset over Mount Columbia, King Edward, South and North Twin Peaks. 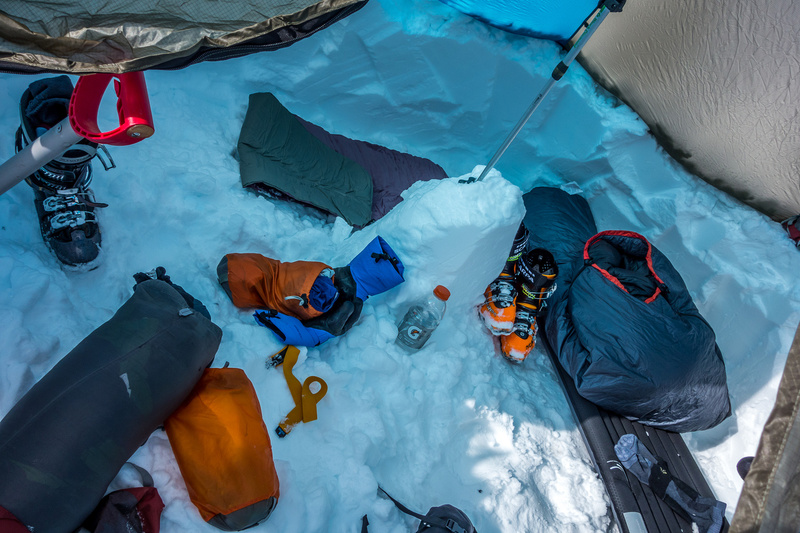 After enjoying a glorious sunset we turned in for the night – nice and warm in our shelters (dug-in BD Mega-lights) and sleeping bags. 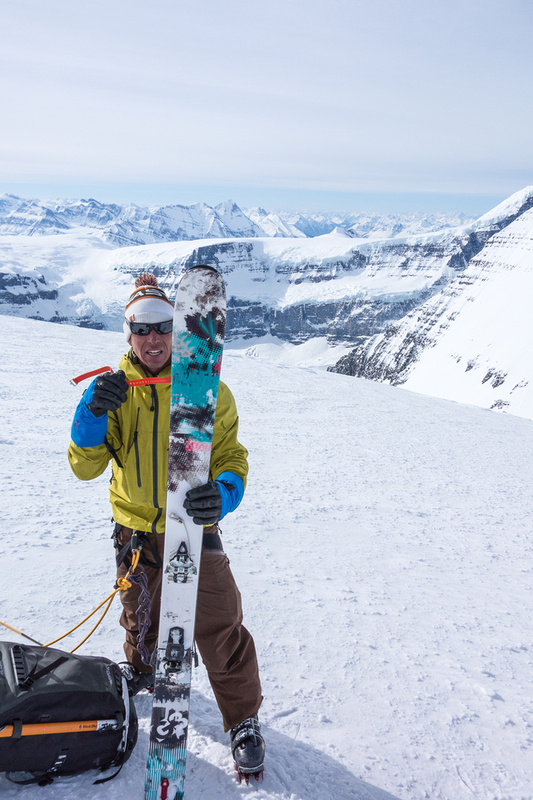 TJ is ready for another go at the northern Columbia Icefields peaks! 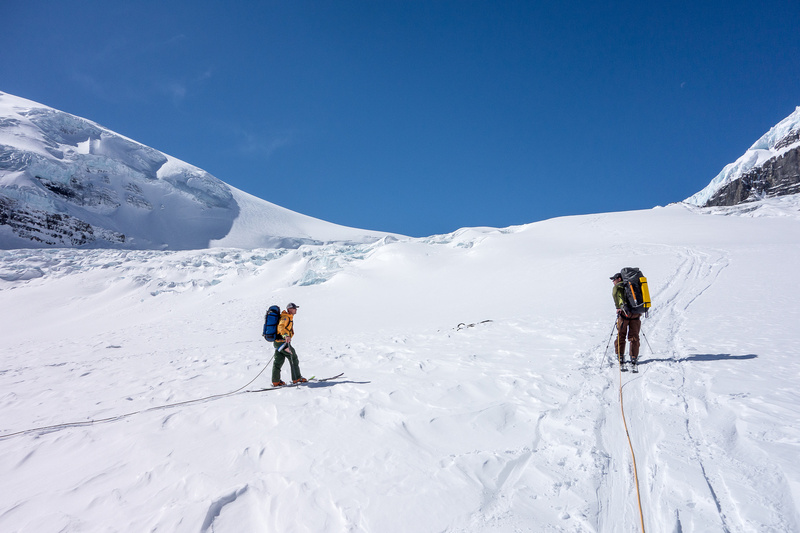 We quickly passed the group at left who turned back from the serac zone and went the other way through the crevasse fields at left. Chatting with the other group. 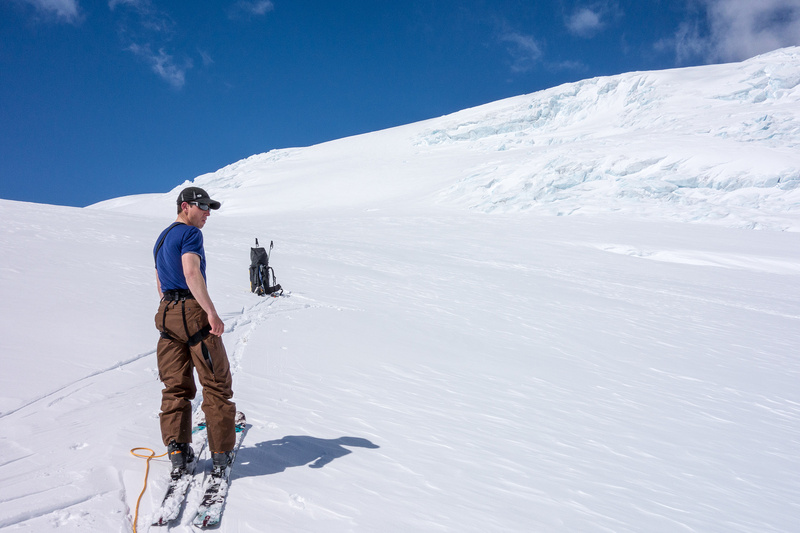 Ascending the ramp to the Columbia neve - this is the key terrain feature that makes the Athabasca Glacier approach to the main ice field feasible. The heat increases as we get into a shallow draw above the ramp. 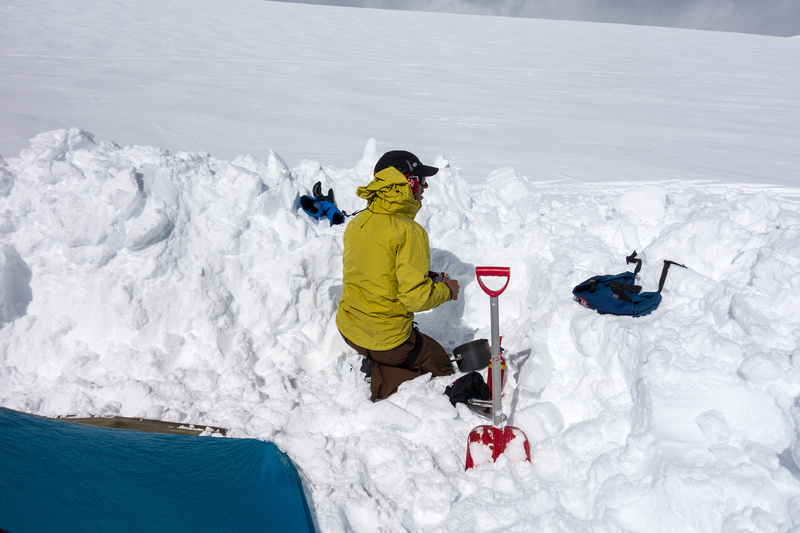 Eventually the terrain goes into a shallow draw which we followed up and slowly around Snow Dome. 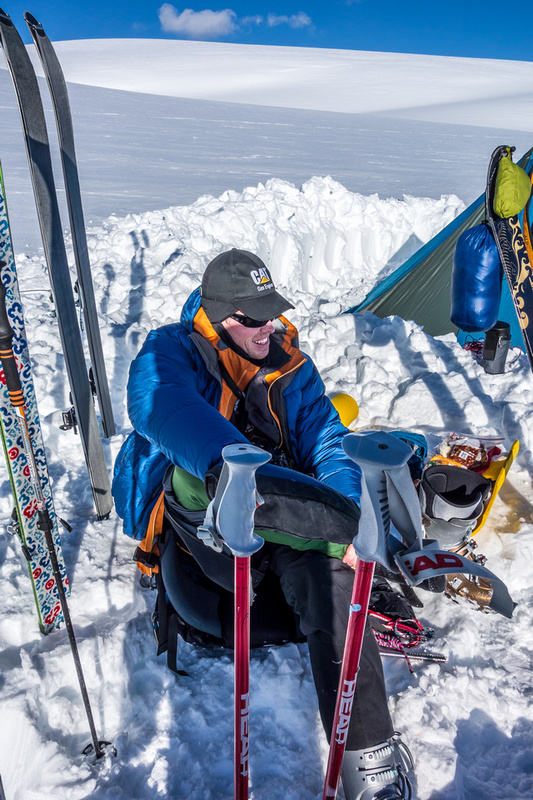 Out of the shallow draw - it is very warm and bright on the ice fields today! 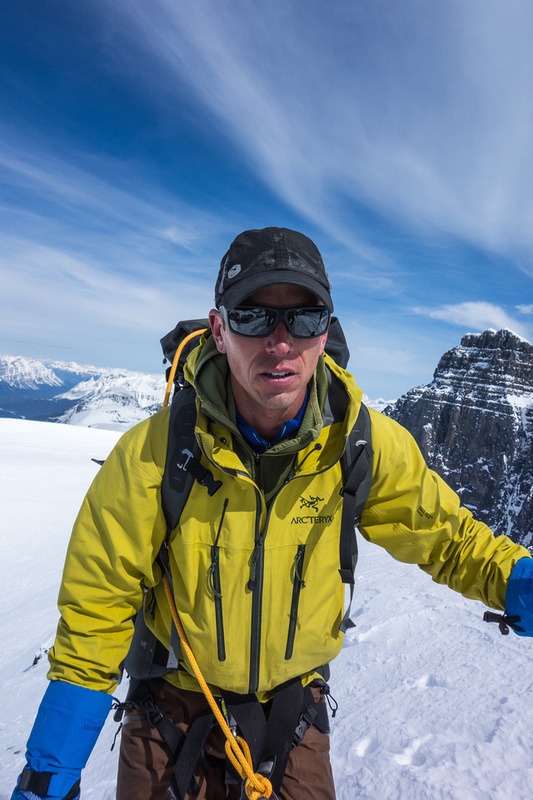 It's like being in an oven when there's no wind and sun on the icefield. Mount Columbia starts coming into view. Andromeda and Androlumbia behind JW. Peaks showing up everywhere now! 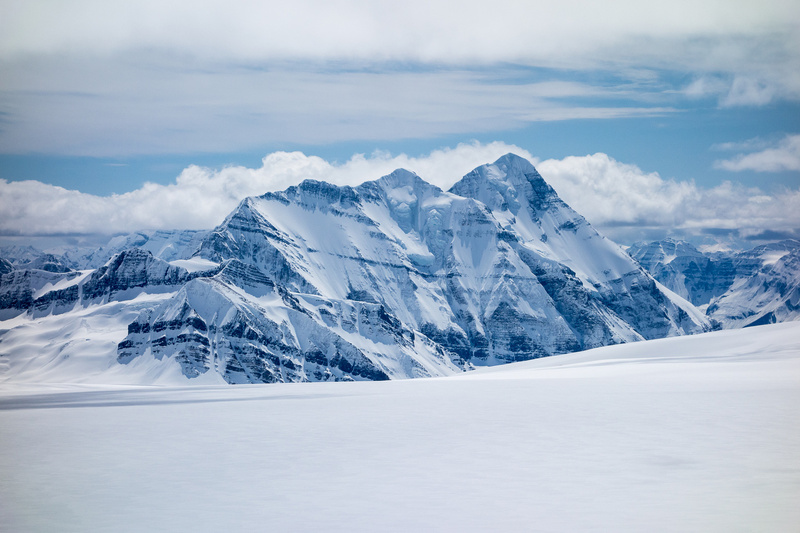 Mount Bryce, Columbia, King Edward and the Twins from L to R.
South (left) and North (right) Twin. Don't they look close? It's at least 2-3 hours just to the base of North Twin from here. Columbia (left) and King Edward (right). We stopped for a break and decided to stay right here! On hindsight it was a great place for us but a bit too far for the other team. Digging out the floor in our Mega Light. 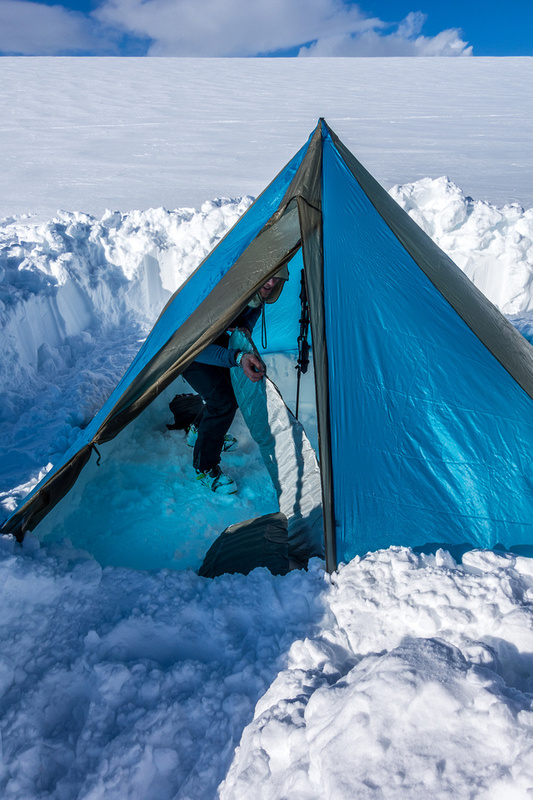 The key with this minimal shelter is to get the floor dug down at least 18 inches. Other teams were waylaid by our camp and decided to set up next to us throughout the afternoon! 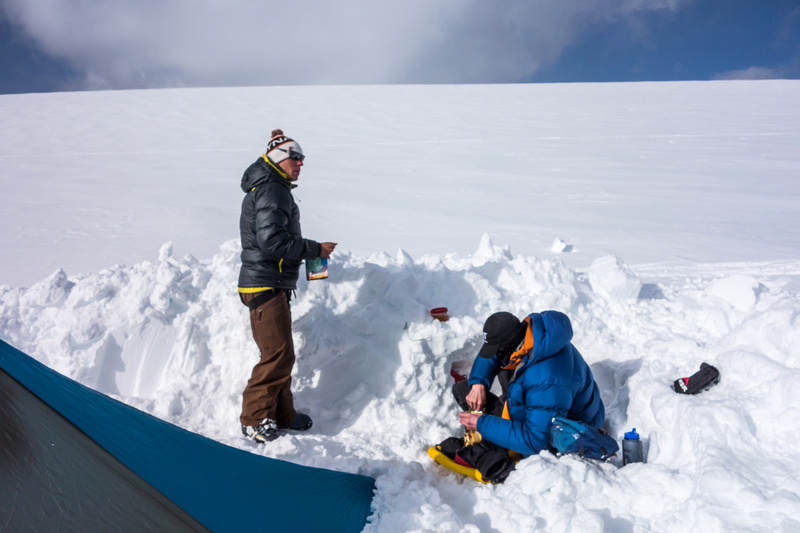 Camping on the Columbia Icefield. Ian is looking forward to supper. The other team starts digging in too. The weather is glorious! W taking off the ski boots. Eating supper on a beautiful evening in the middle of a white ocean. What could be better than this? Evening settles in around camp. 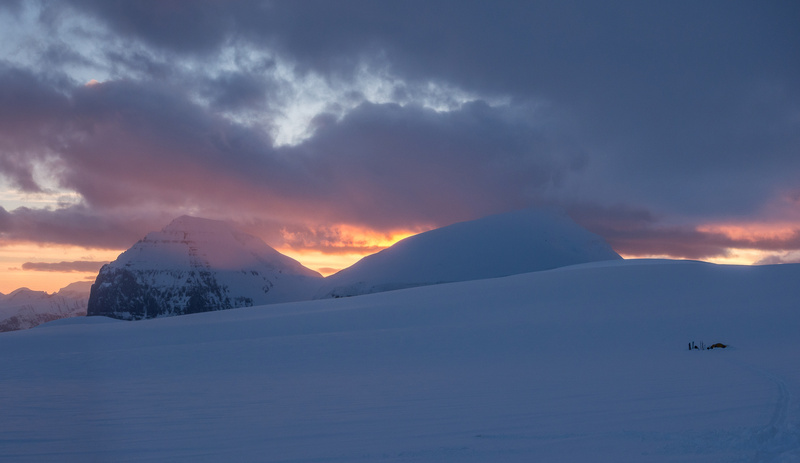 Sunset on the Columbia Icefields. Sunset over South and North Twin Peak. Sunset over Columbia, King Edward and the Twins. 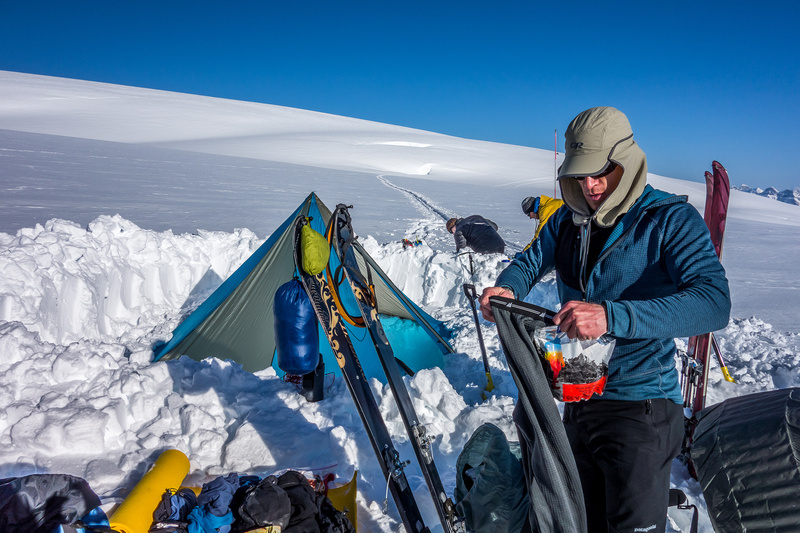 We woke up at around 05:00 on Saturday, ready to climb our last two northern icefields peaks, West and South Twin. 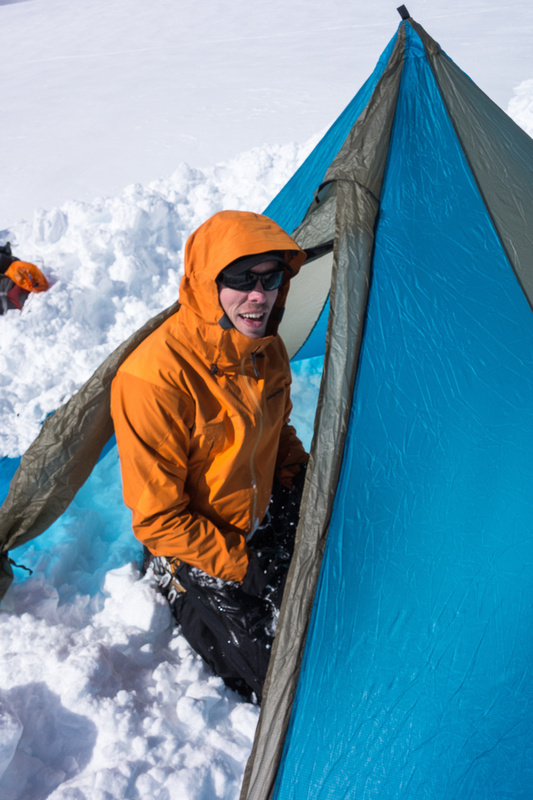 It was a pretty cold morning, which made getting out of the warm sleeping bag pretty difficult but made us confident in the travel conditions and in the east face of West Twin – a severe avalanche slope. 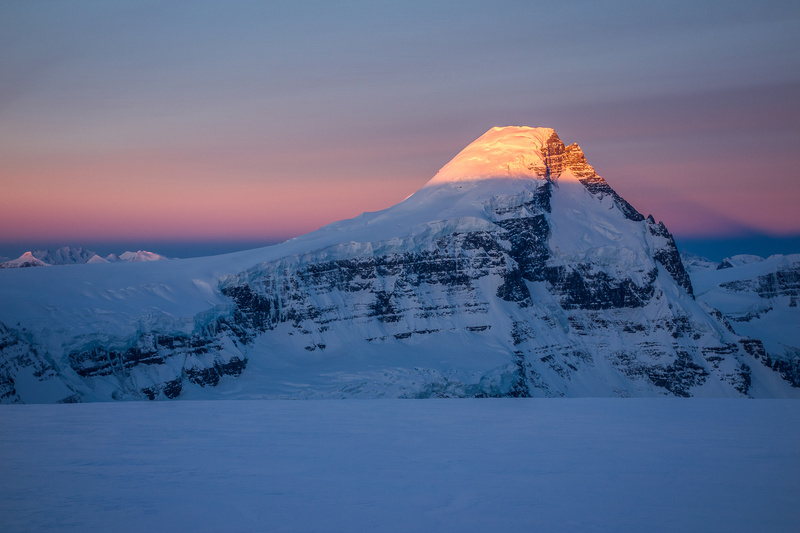 Mount Columbia casts an early morning shadow towards the lower Mount King Edward. 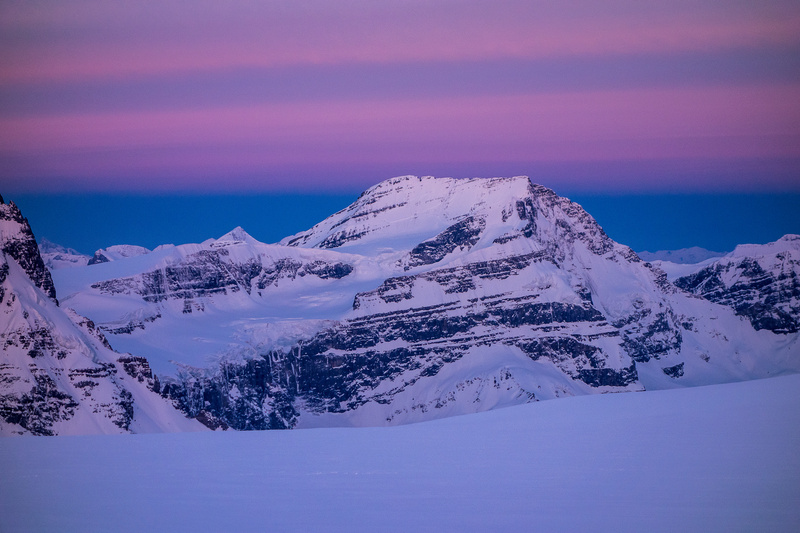 Sunrise on some icefields giants. 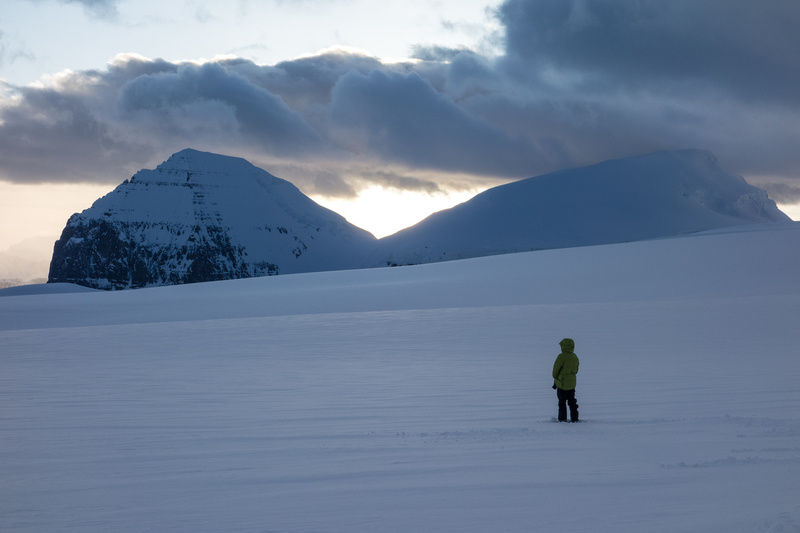 The ski to North Twin took more energy than most of us were expecting. It was exhausting or anything, but it’s still over 6km and at least a couple hundred meters of height gain / loss before you’re finally looking up at the actual ascent slope on North Twin’s south shoulder. More than one member of our party mentioned how camping closer would be nice “next time”. 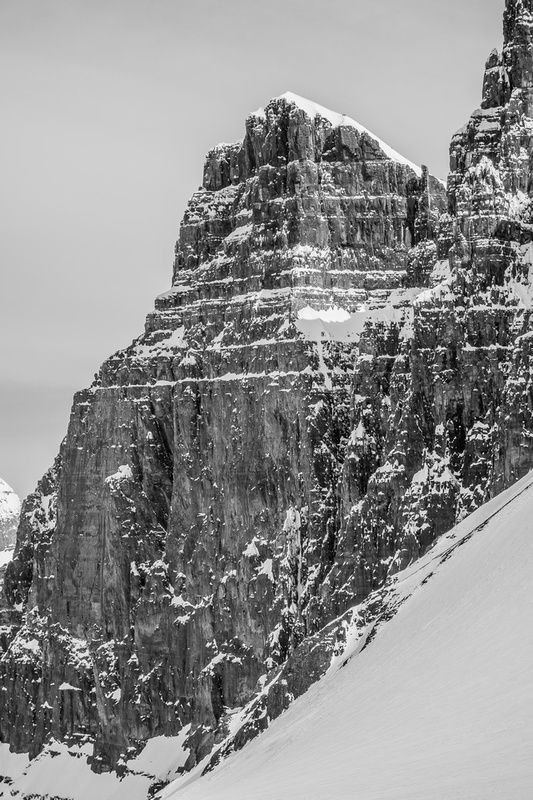 A snowy sub peak of South Twin, less than a kilometer to the northwest. 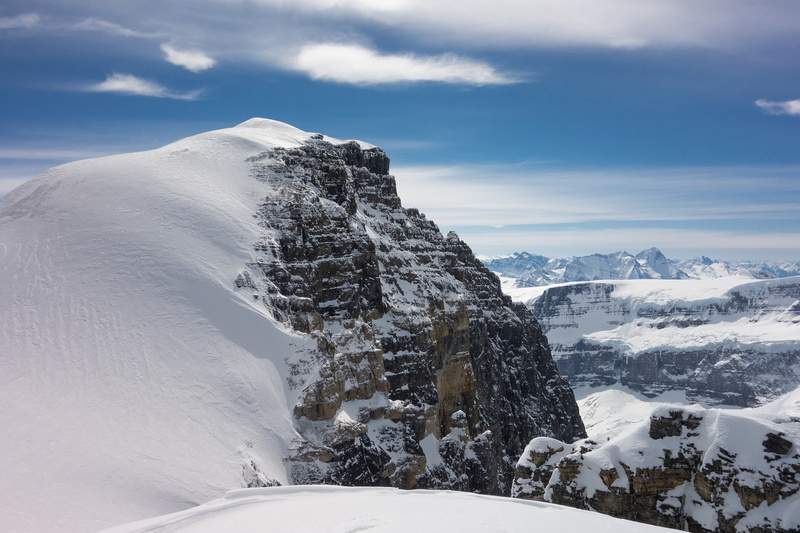 This snow bump is included on usual peakbaggers list of Canadian Rockies peaks above 11,000 feet. Height notes: It was not listed at all in Putnam 1974 – from bivouac.com. This route is probably the safest but also involves a whole lot of ‘wasted’ height gain / loss. 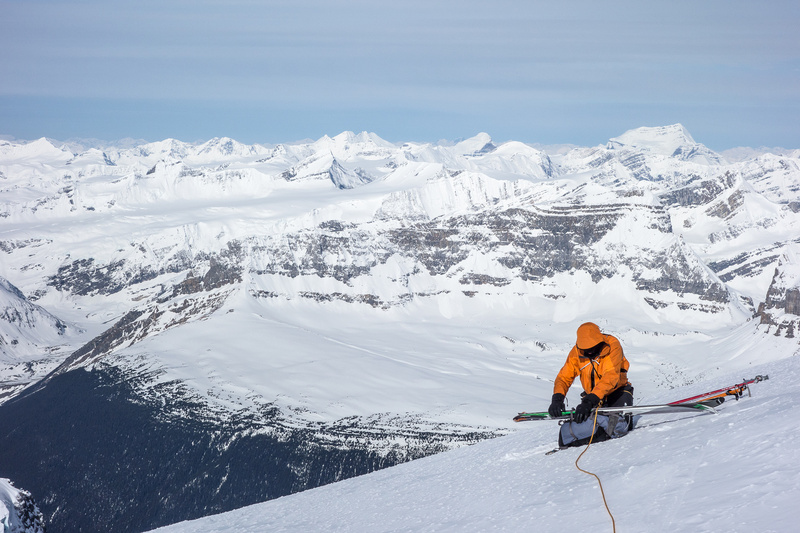 Simply ski your way up the south ridge of North Twin until you’re almost on the summit ridge, trending skier’s left around the mountain as you gain height. Now go to the west edge and realize you’re higher than West Twin and at the same height as the summit of South Twin (11,800 feet!!). Now simply trend southwest down North Twin until the route down to the col becomes obvious beneath you. This will be either on snow or ice or like we had – a mix of both. 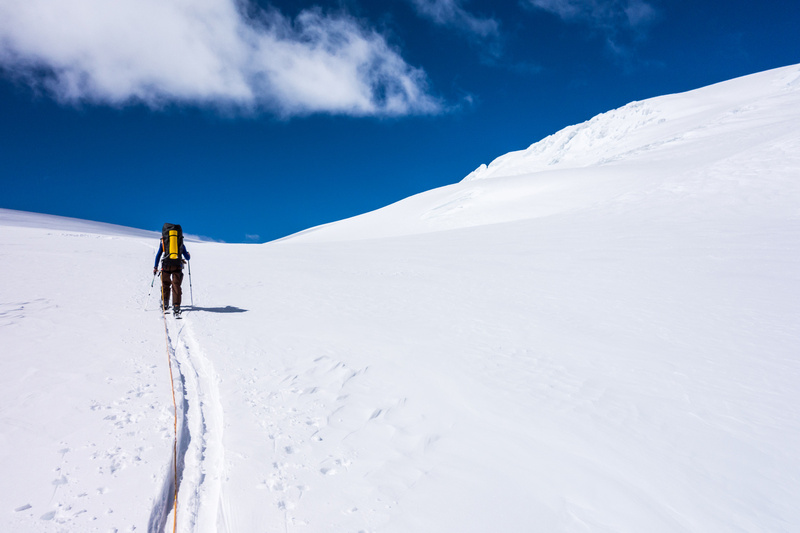 Most people take their skis off for this route and use crampons, as we did. 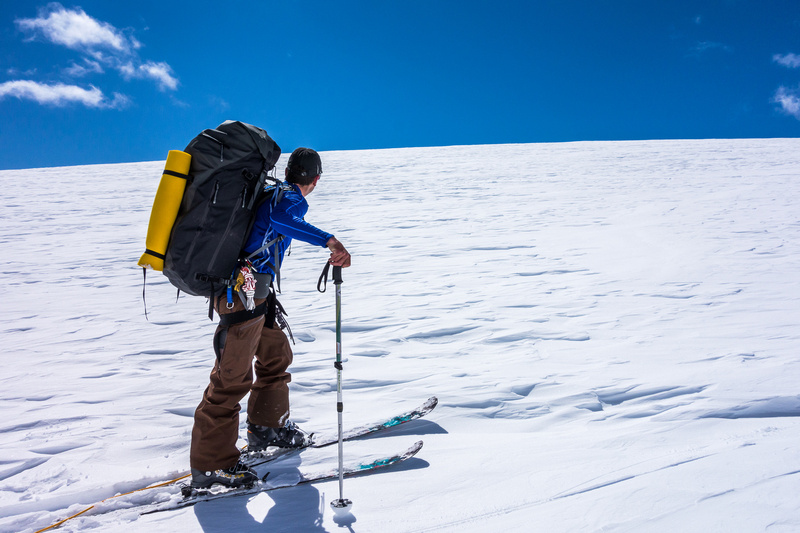 Never go skier’s right down the west face, simply let the terrain guide you in a southwest trending descent. 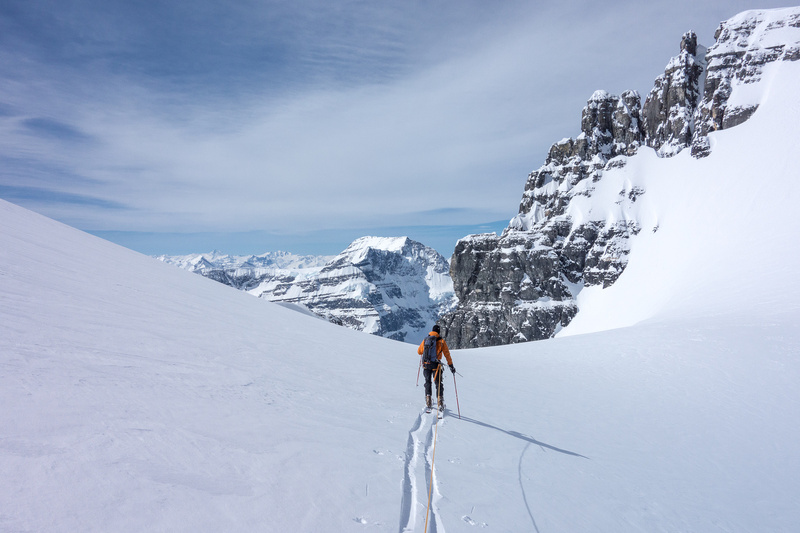 We estimated that we probably gained well over 250 extra meters on this route and skied further too. Obviously if you’re doing all 4 Twins on the same day, this is your descent route from the summit of North Twin. 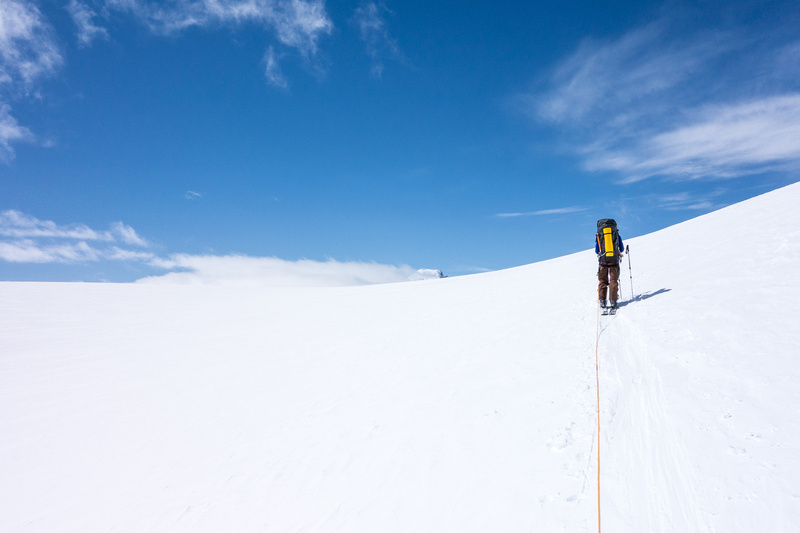 We noticed the low snow coverage compared to 2012 while descending to the col. JW must have stepped in at least 4 or 5 “ankle biter” crevasses on the way down! This route does have some pretty exposed avalanche terrain on it, but honestly if you’re that worried about avalanches you probably shouldn’t be attempting either West or South Twin anyway… The key to this route is to stay above the ice fall on North Twin’s lower south / west shoulder and use an obvious bench to traverse around the mountain. Eventually this bench leads you to steep avalanche terrain and may be quite icy or very hard snow. 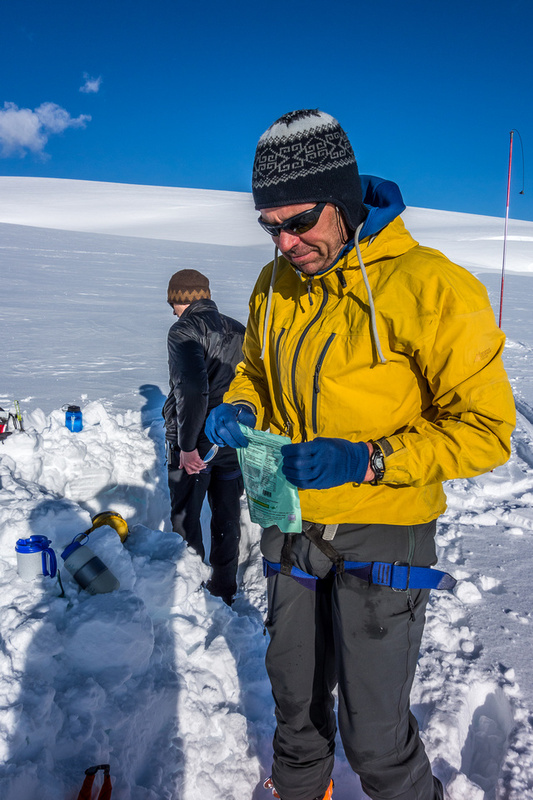 Ski crampons are VERY useful on both routes to the South / North twin col. 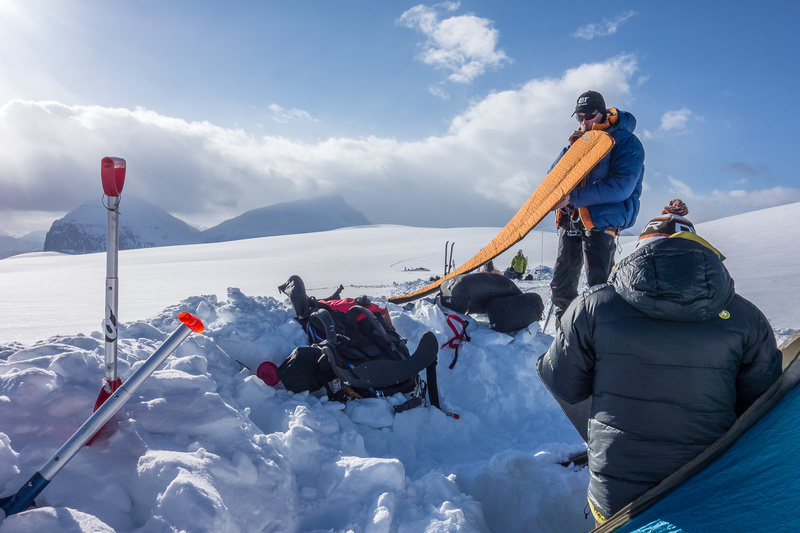 If it’s really icy you may have to carry your skis across the final steep avy slope before linking up with the ridge from route 1 and descending to the col on your left. 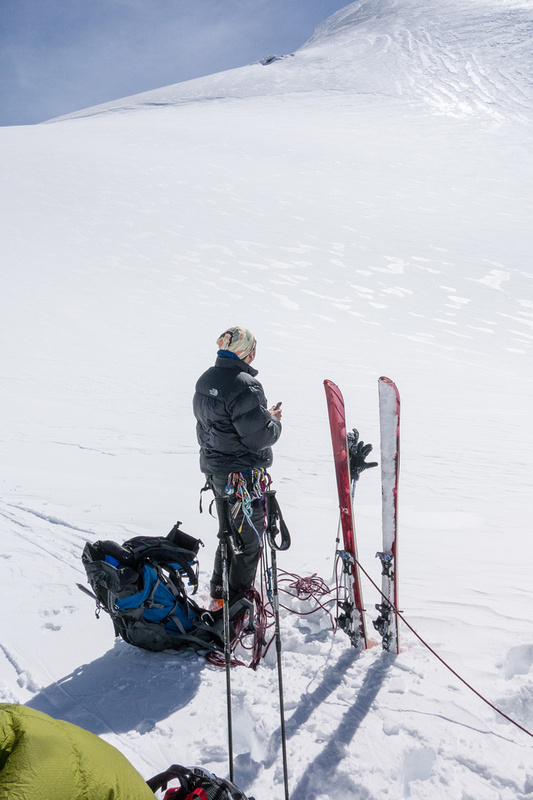 (We carried our skis from the col up to the steep traverse slopes and then around until we were on the bench on our way back along this route.) 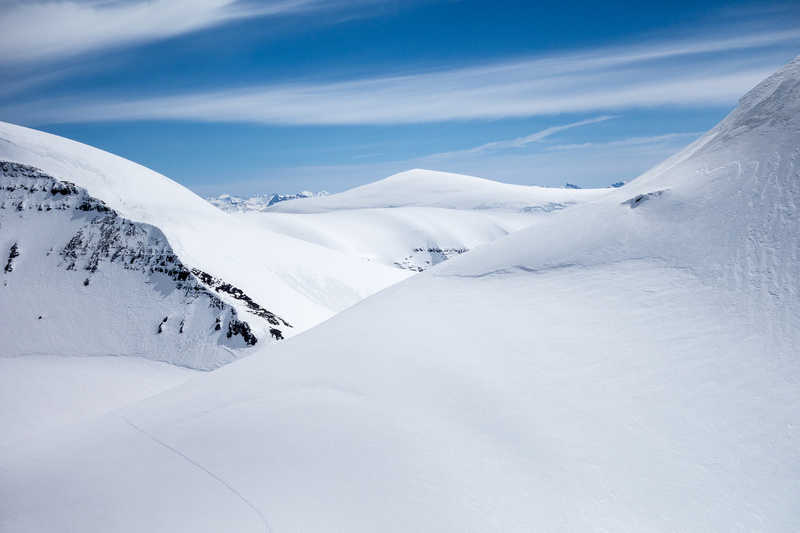 You need a pretty good snow year to be able to ski the whole way on either route. 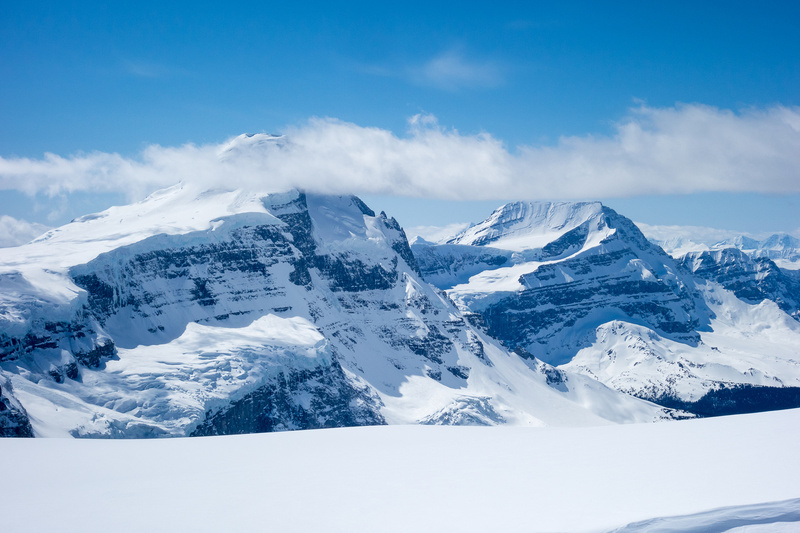 Skiing around the south shoulder of North Twin – Kitchener and Snow Dome in the distance. 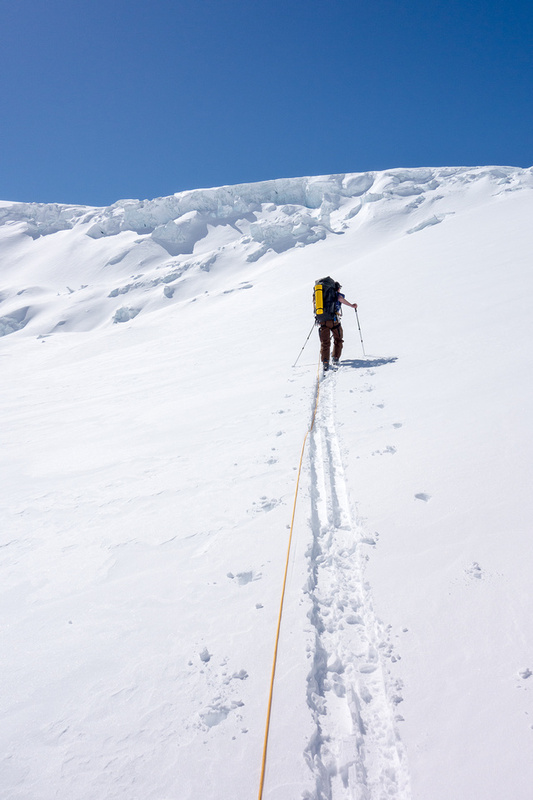 Ski crampons were nice to have here – it’s steeper than it appears on the photo and got way steeper yet. 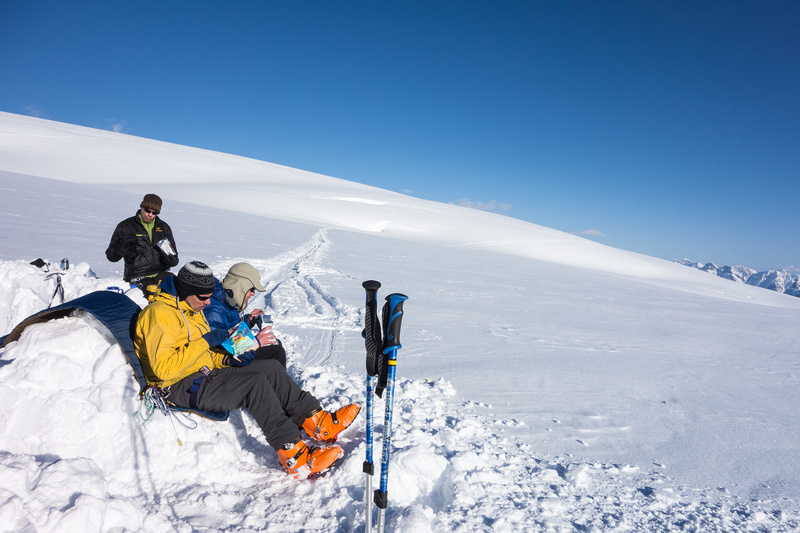 After descending to the South / North Twin col we took a quick break before skiing over to South Twin’s shoulder. 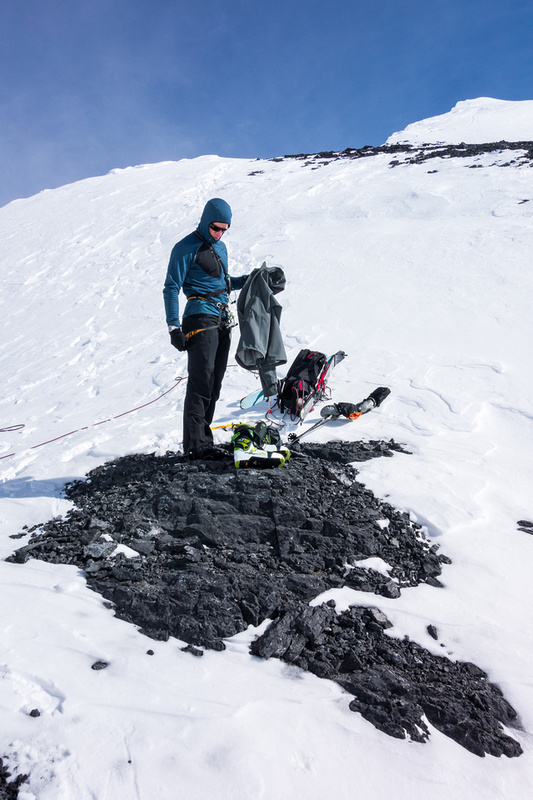 You may wonder if it’s worth skiing to West Twin or leaving your skis behind, but it’s further than you’d think and skis are probably a good idea from a crevasse perspective too. There are a lot of holes in this area and you need every advantage possible to AVOID FALLING IN them. Trust me. After a very steep (and I might add another place I wished I had ski crampons) traverse on South Twin’s northeast lower ridge we made a beeline for the South / West Twin col.
One of my favorite shots of the trip – JW poses in front of South Twin on the descent to the col. From this angle the north ridge looks so easy… We stepped in a whole bunch of cracks on this slope – as you can see there’s not much snow on it. Looking across South Twin’s east face towards the Columbia Glacier plunging into Columbia Lake at the far side of the trench. The east face of West Twin was looking pretty darn steep to me – especially with the full sun on it and a full load of snow that hadn’t slid yet. 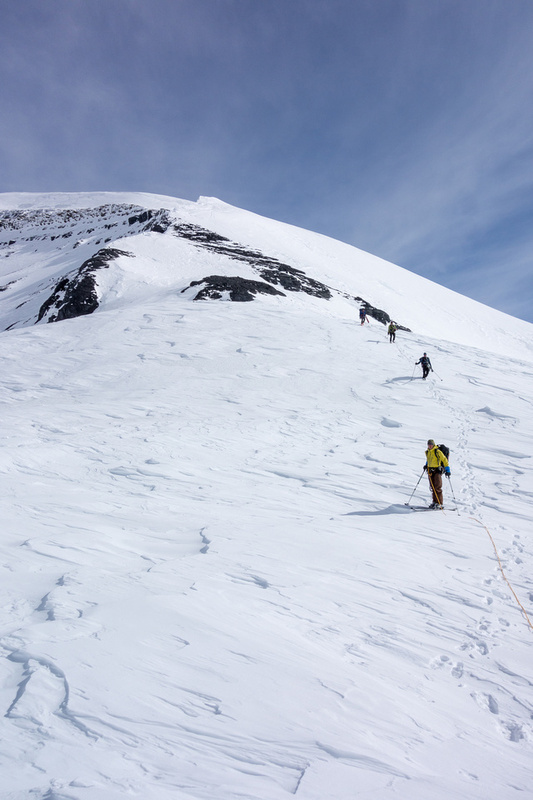 There are a few routes to the top but we chose a direct line up to the summit – we emerged off the face just to climber’s right of the summit. 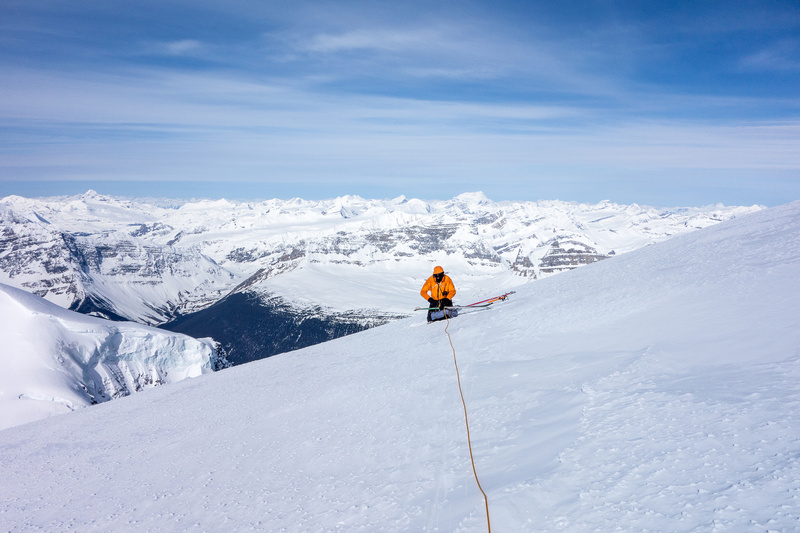 Any choice you make here has hazards including a ‘schrund, cornices and obviously a pretty darn steep avy slope. We made a good choice given a firm and consolidated snow pack and a semi-permanent and small (compared to the others) cornice. 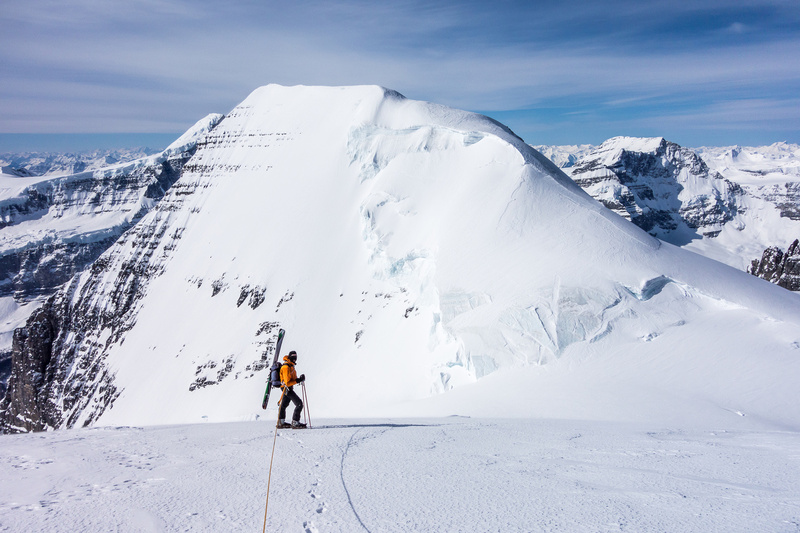 I have to admit that there were a few moments when we crossed the ‘schrund and went up a slightly convex roll of looser snow on the upper 1/3 of the face that I was feeling a wee bit nervous! 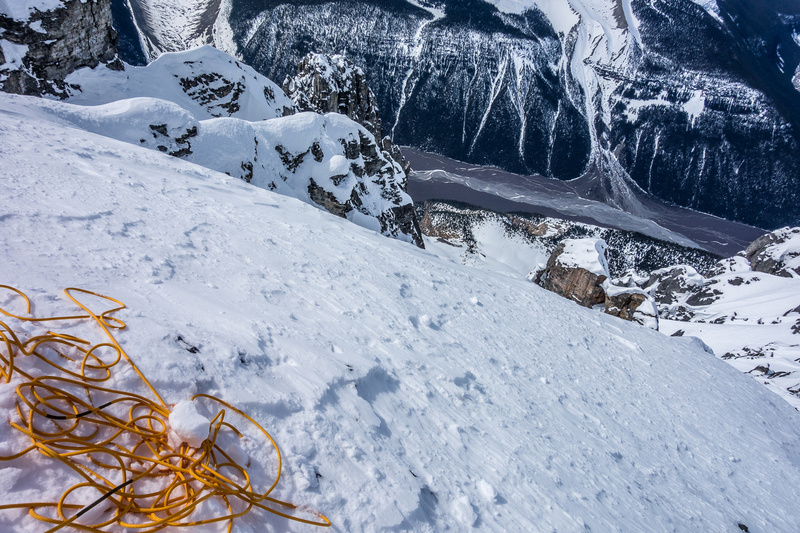 JW was the hero this day – kicking good steps quickly and efficiently up the south face and allowing us all to get off it as quickly as possible. TJ skis towards West Twin Peak. 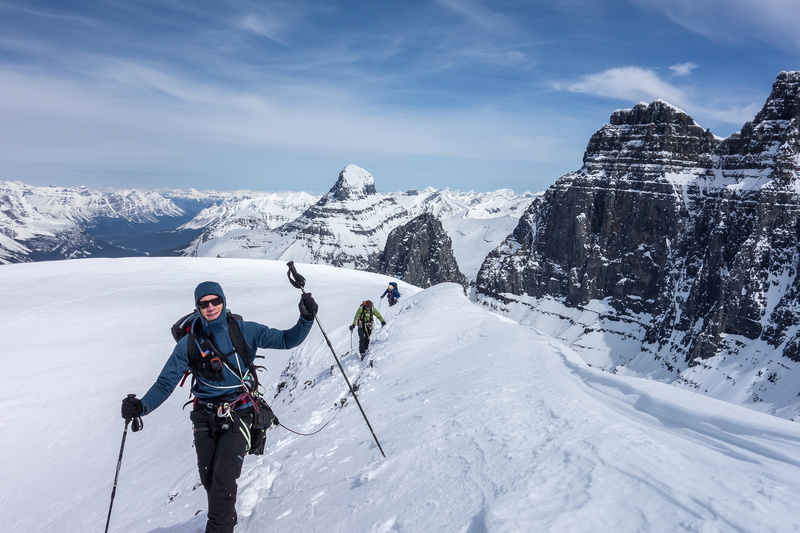 This photo from the group following us shows JW, myself and TJ on the very steep east slopes of West Twin. 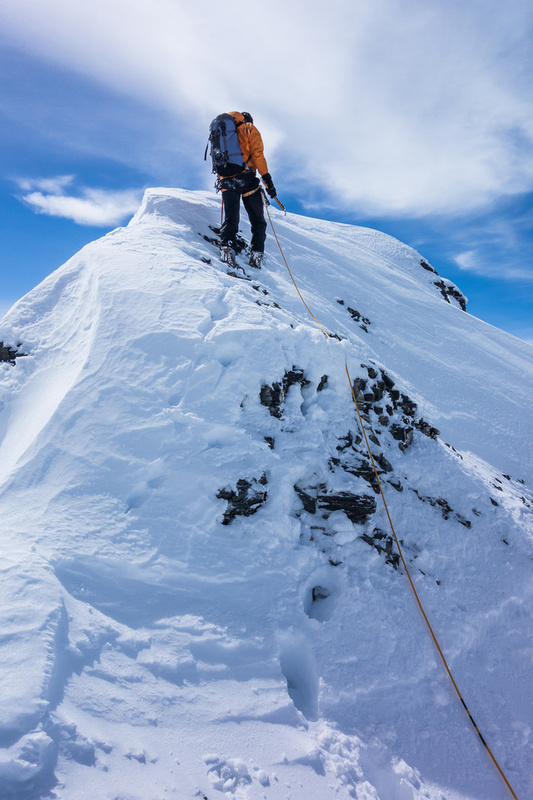 A short scramble along a semi-exposed ridge brought us to the summit with glorious views in all directions! WOW – what views!! West Twin may be ‘small’ compared to it’s Twin siblings but it’s still over 11,000 feet and the 2000 meter drop into the Columbia valley far below was impressive. Views included Columbia, Edward, South Twin, North Twin, Twins Tower, Warwick, Sundial, Massey, Clemenceau, Tusk, Tsar, Somervall and so many others that I couldn’t name them all here. 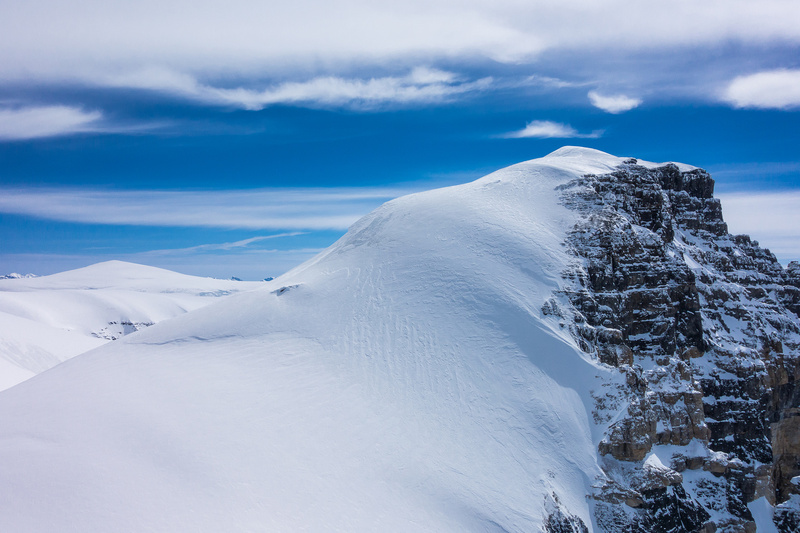 I really enjoyed the summit of West Twin – the views were more stunning than I was expecting. 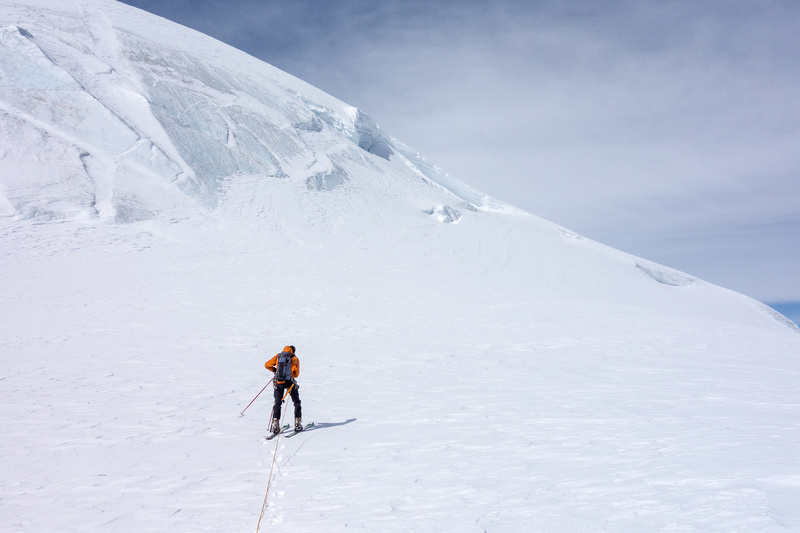 JW leads up the summit ridge – mostly a scramble after the steep east face. Yeah baby!! Summit of West Twin with Columbia in the background. Looking back at Alberta, Twin’s Tower, North Twin, Stutfield and South Twin from the summit of West Twin. 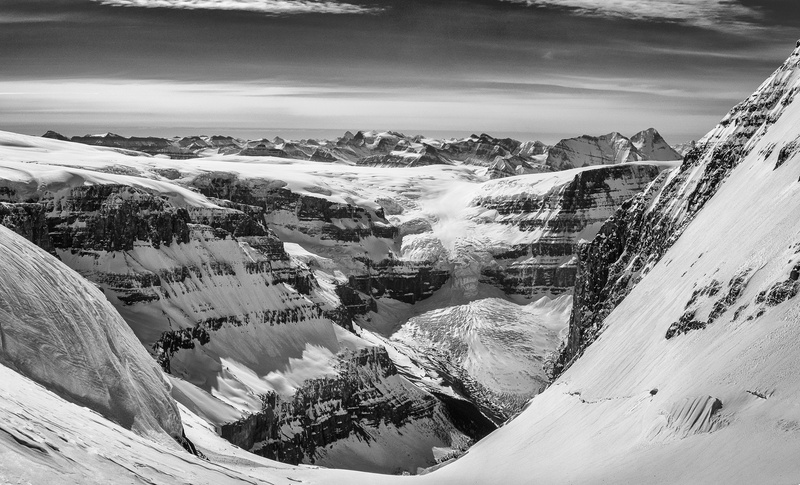 Looking far down the Athabasca River valley past King Edward and Columbia at left. After enjoying the views it was time to get down the east face before the sun got any hotter than it already was. We even managed a short (and fast!) glissade at the bottom of the slope! After a short break at the bottom it was time to head for South Twin Peak. Mount Columbia casts an early morning shadow. Note the shadow from Columbia? The Twins are also catching light now. Mount Columbia and the Twins at sunrise. 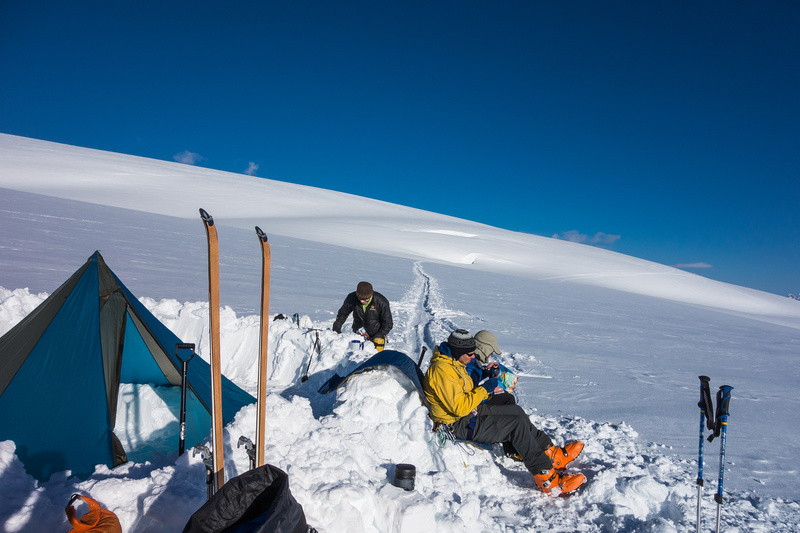 Skiing from camp at first light. North Twin at left and Stutfield at right. 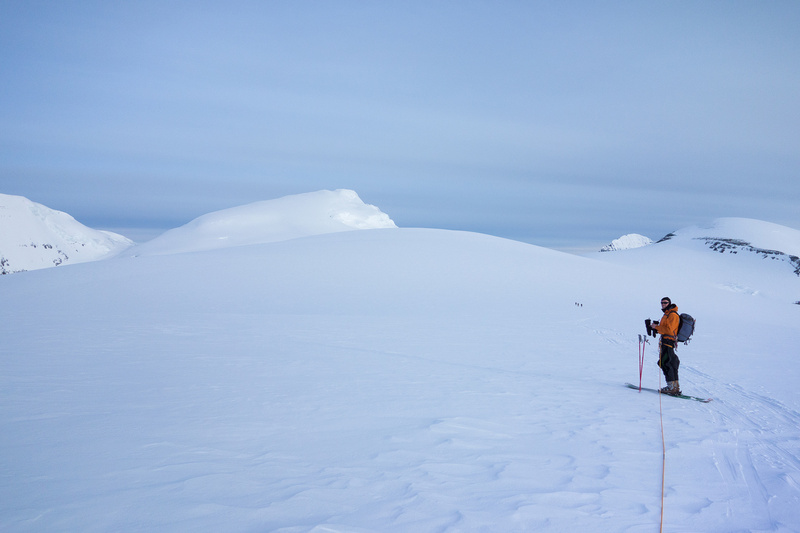 Looking back at the team and our camp (5km back) as we approach North Twin (on the right). Finally ready to ascend North Twin's south slope. Alberta in the background and Stutfield on the right. Skiing around the south shoulder of North Twin - Kitchener and Snow Dome in the distance. Preparing to descend to the North / South Twin Col.
JW puts on his crampons. Note how bloody high up we are on North Twin?! We're as high as South Twin and much higher than West Twin (center of photo)! TJ gets ready to pack his skis. 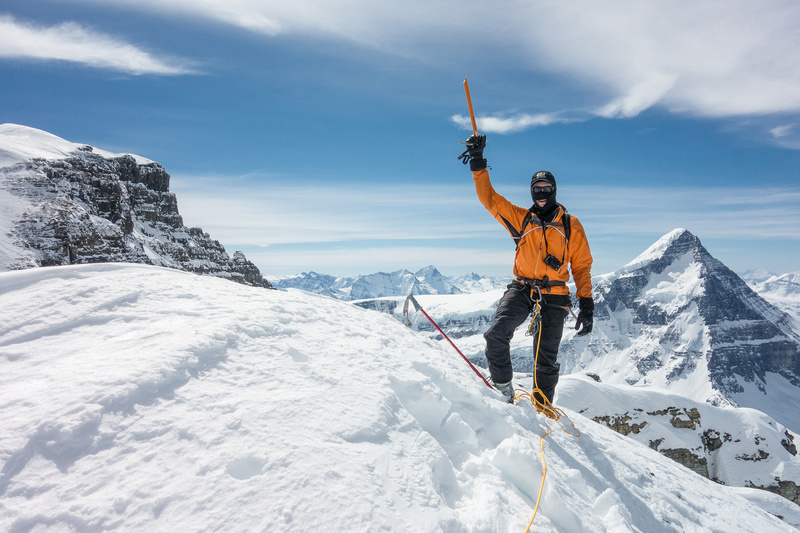 One of my favorite shots of the trip - JW poses in front of South Twin on the descent to the col. 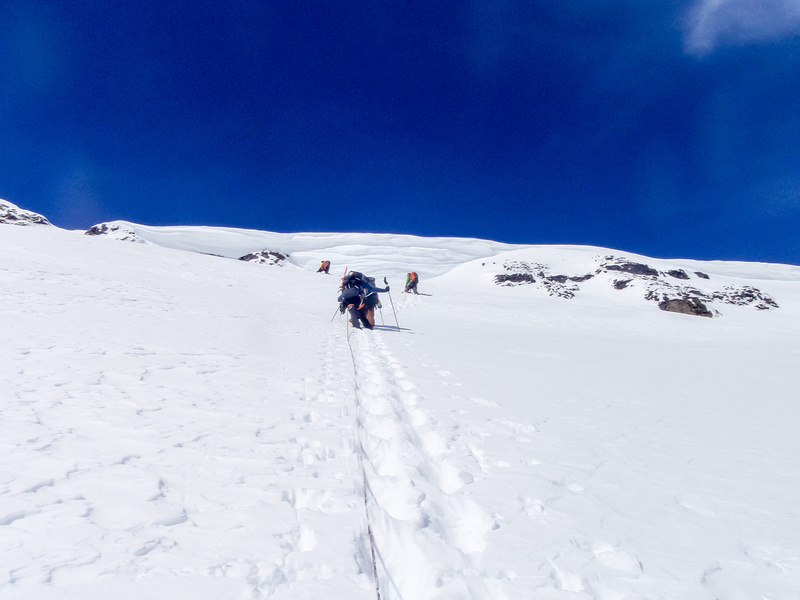 Descending to the South Twin col. Taking off extra layers - the sun is getting warm now. We put the skis back on soon after this. Looking across South Twin's east face towards the Columbia Glacier plunging into Columbia Lake at the far side of the trench. There is a steep roll in the slope over the shoulder of South Twin. The group descends North Twin's south ridge. There are people already on the summit of Twin's Tower! JW skis to the South / West Twin col. The summit of West Twin on upper left, Twin's Tower on upper right. 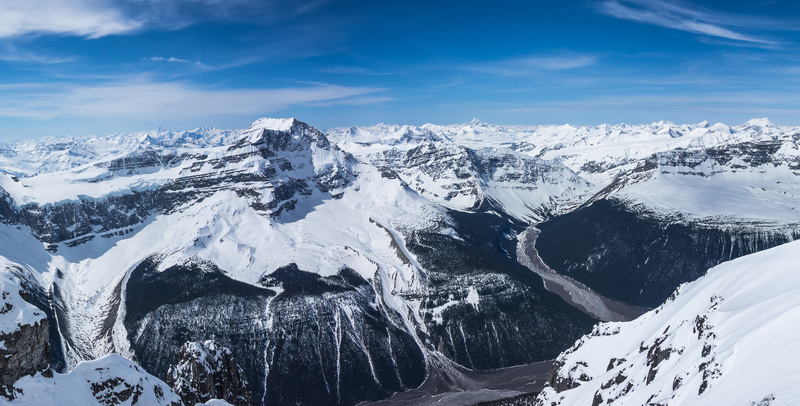 Looking off the east face of West Twin with Mount Bryce in the background and South Twin's summit on the left. This isn't even the steepest part! Off the face and looking along the summit ridge over at South Twin. 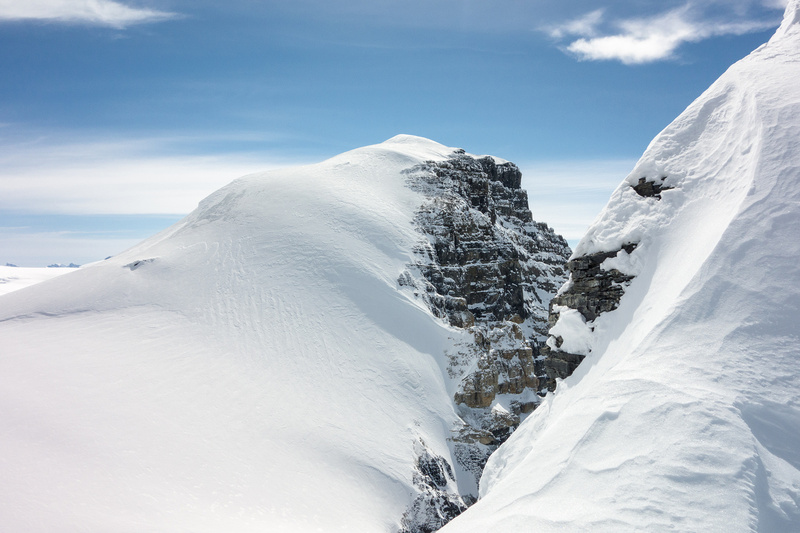 You can spot the rocks we skied to on South Twin and the ice bulge where the crevasse incident happened. JW leads up the summit ridge - mostly a scramble. Looking back at Alberta, Twin's Tower, North Twin, Stutfield and South Twin from the summit of West Twin. 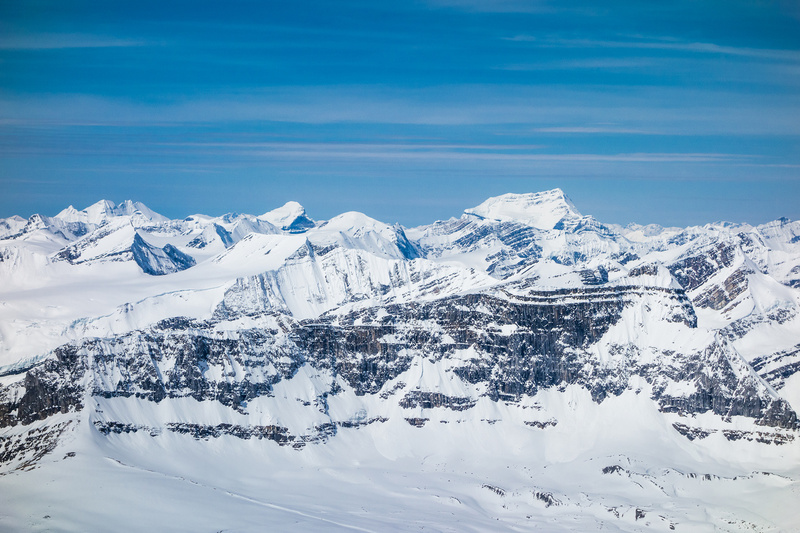 Looking far down the Athabasca River valley. King Edward and the Columbia River valley FAR below (2000+ meters!). Tsar, Clemenceau and many, many other peaks are in this stunning view. TJ on the summit of West Twin. Stutfield Peak and our approach tracks coming over the north ridge of South Twin. 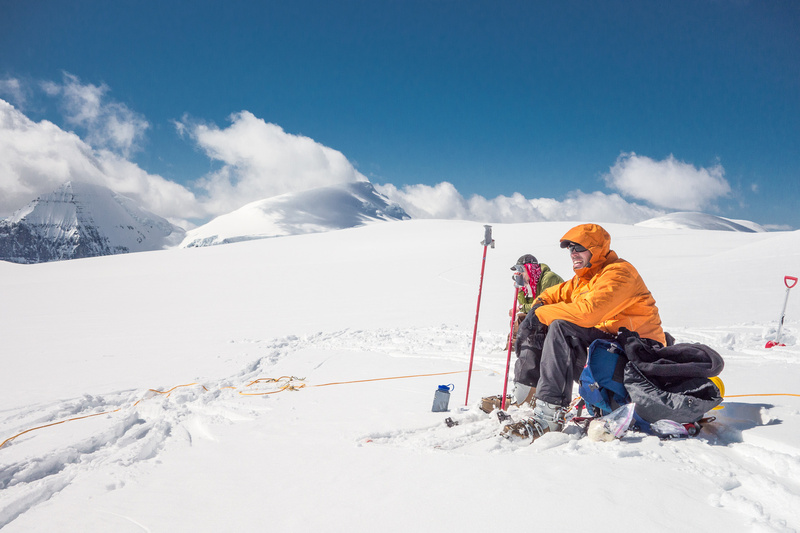 The other rope team is happy to make the summit of West Twin! This is their first "Twin". Twins Tower and North Twin Peak. South Twin Peak from West Twin. 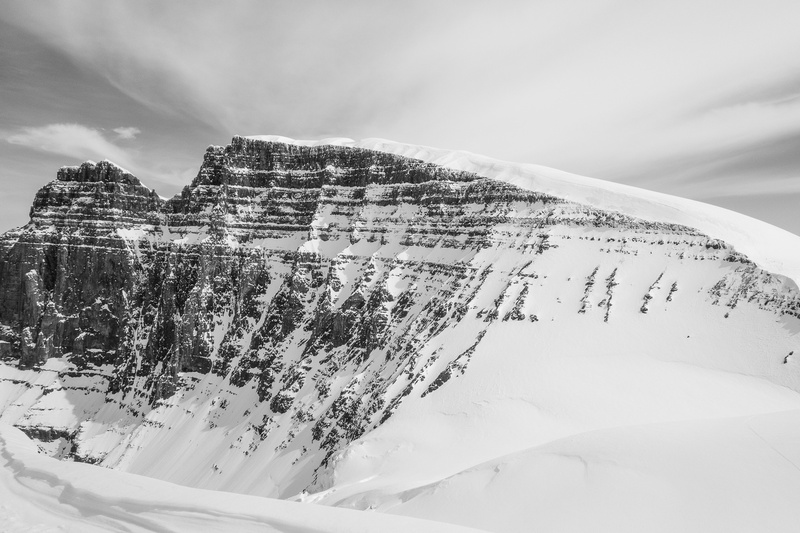 The graceful summit ridge of South Twin looks so easy from here. I thought for sure we'd be basically walking up it at this point. 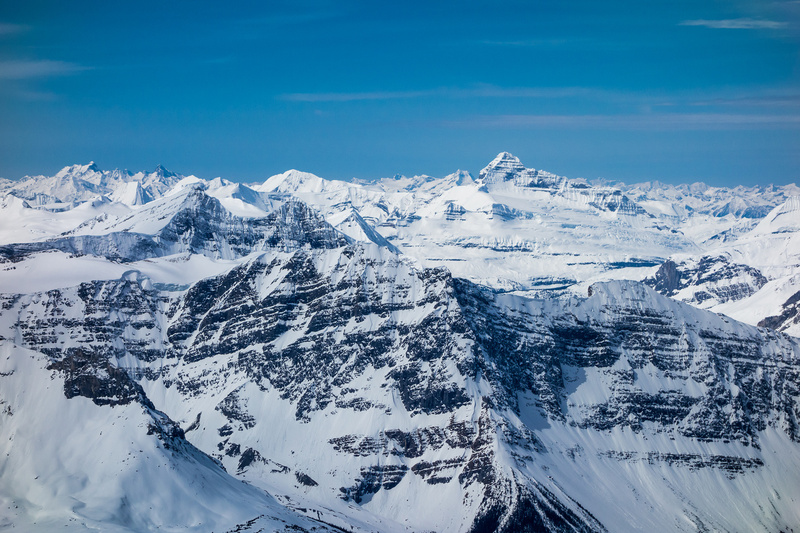 It's a bloody long drop to the Columbia valley floor! Over 2000 meters! The Adamants and Sir Sanford are visible in the far distance on this gorgeous day. Tsar Mountain is on my hit list. 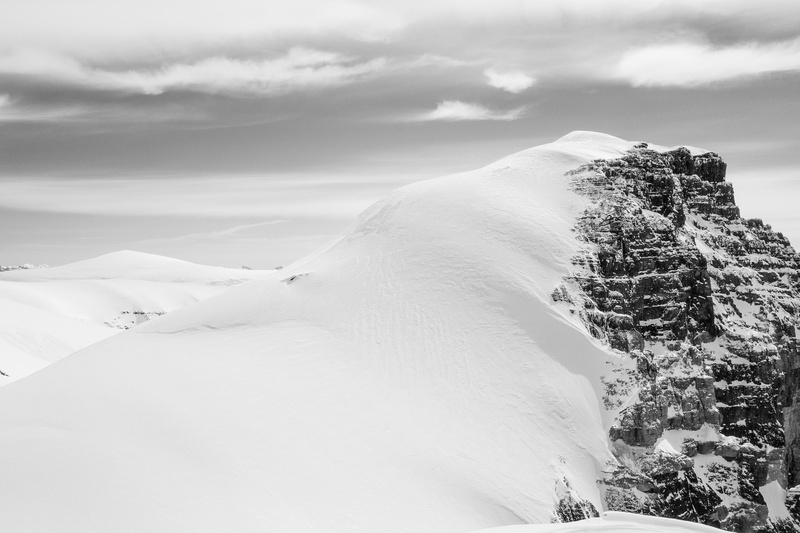 Clemenceau is another gorgeous 12,000+ foot peak. Heading back on the summit ridge with the north and east peaks on display. Anton prepares to descend the east face. 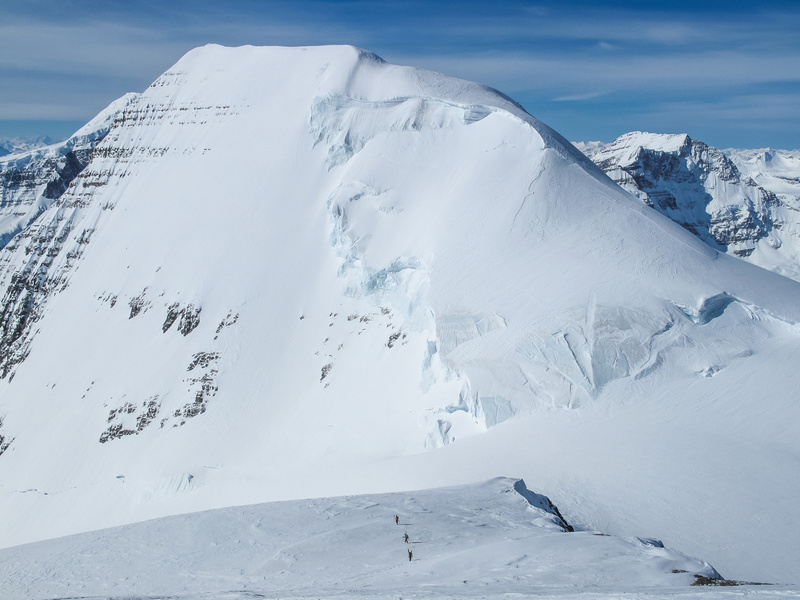 Unknown to him at this time, the area just above his head on South Twin's north ridge would be his prison in less than an hour. Waiting back at the skis for the other group to break trail to South Twin.